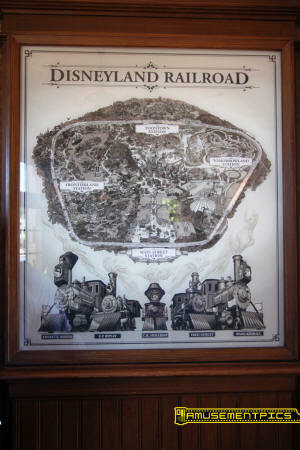 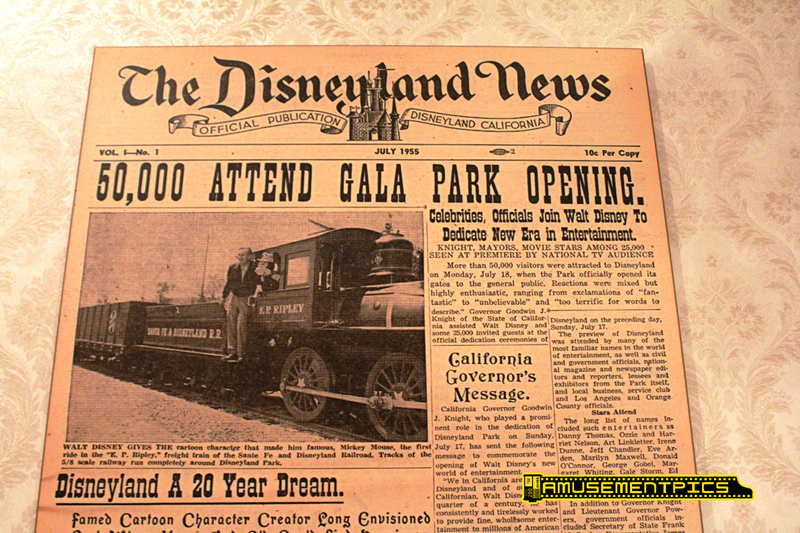 Walt Disney was a huge fan of trains and the Dinseyland Railroad was an important part of his revolutionary idea of the theme park. 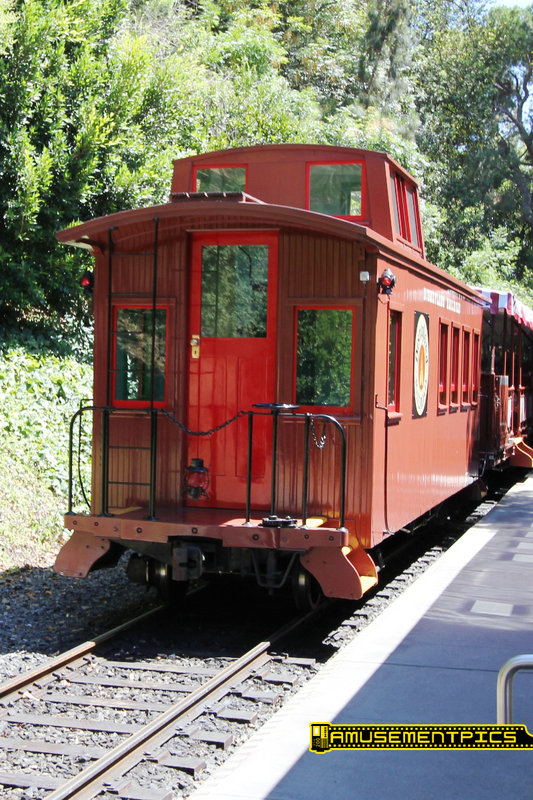 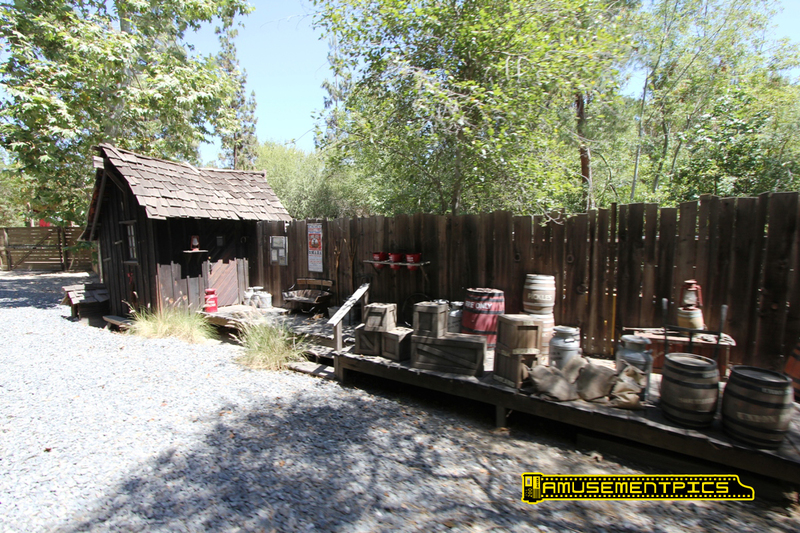 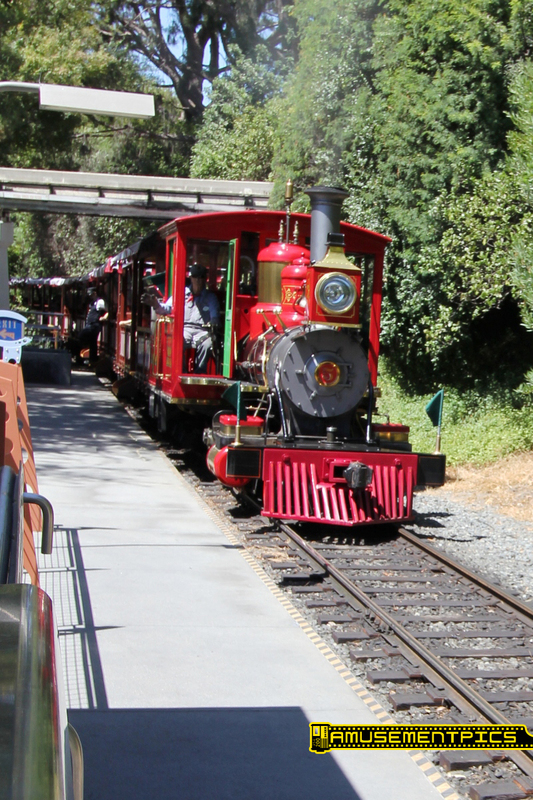 The narrow gauge Railroad was designed to circle the park with just over a mile of track, as a ride and mode of transportation. 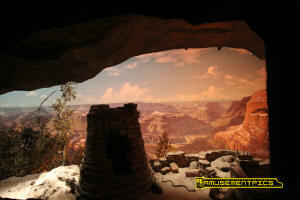 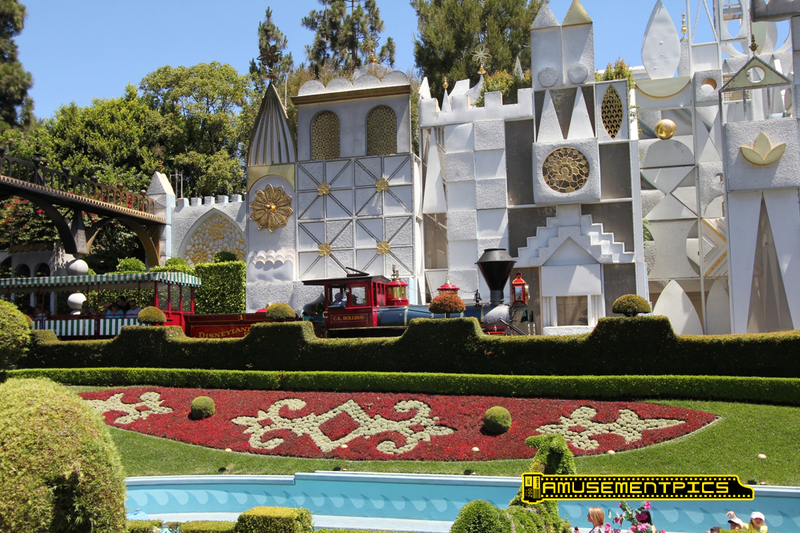 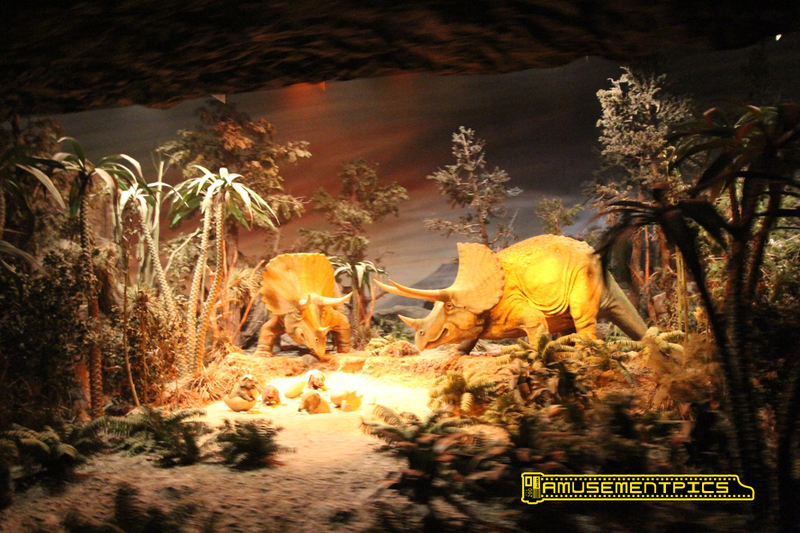 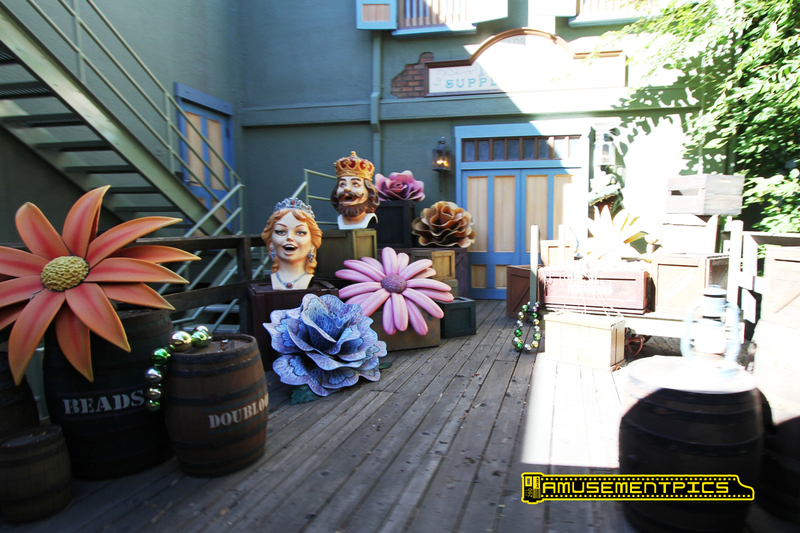 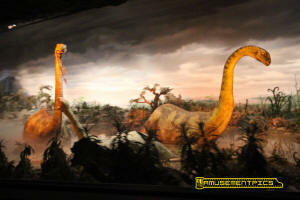 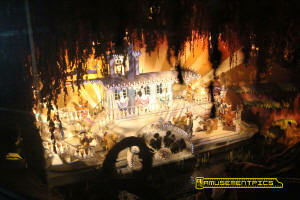 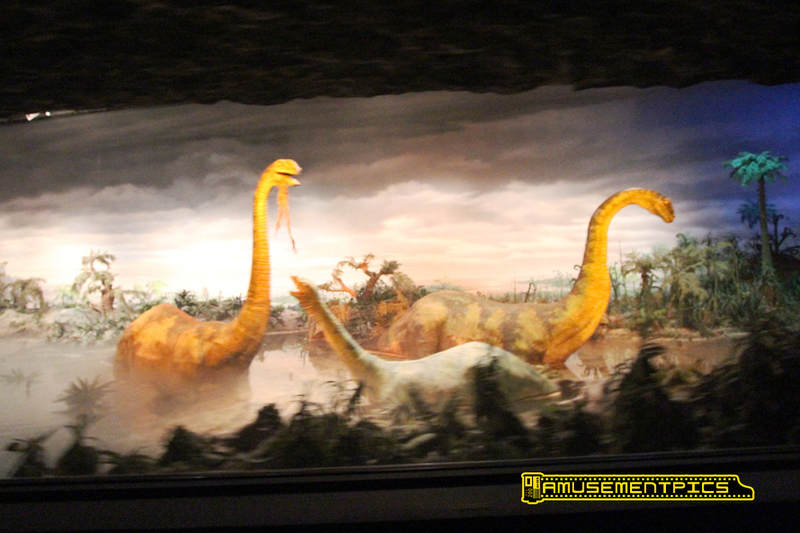 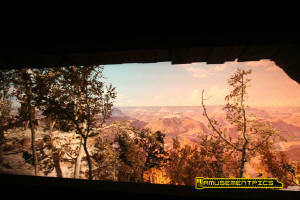 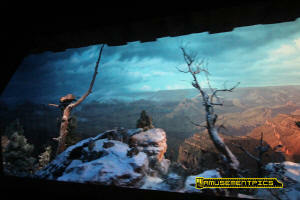 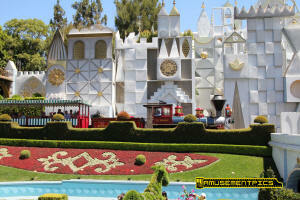 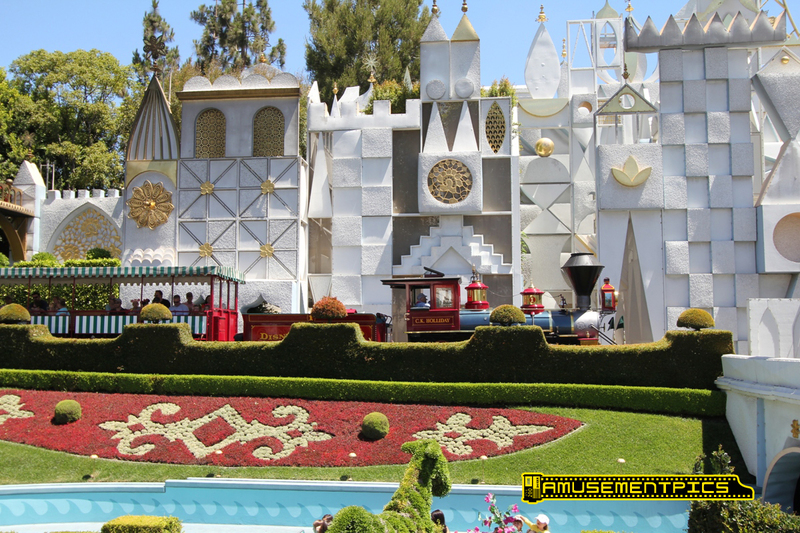 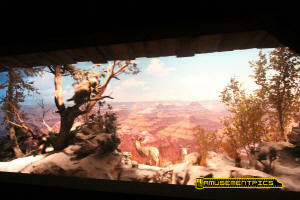 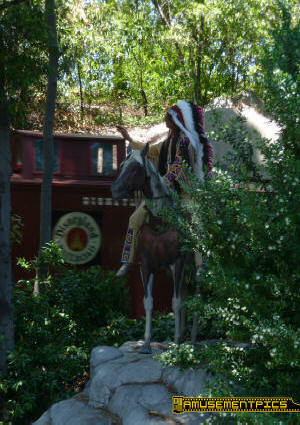 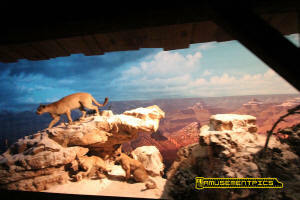 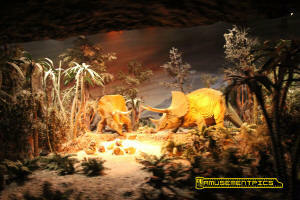 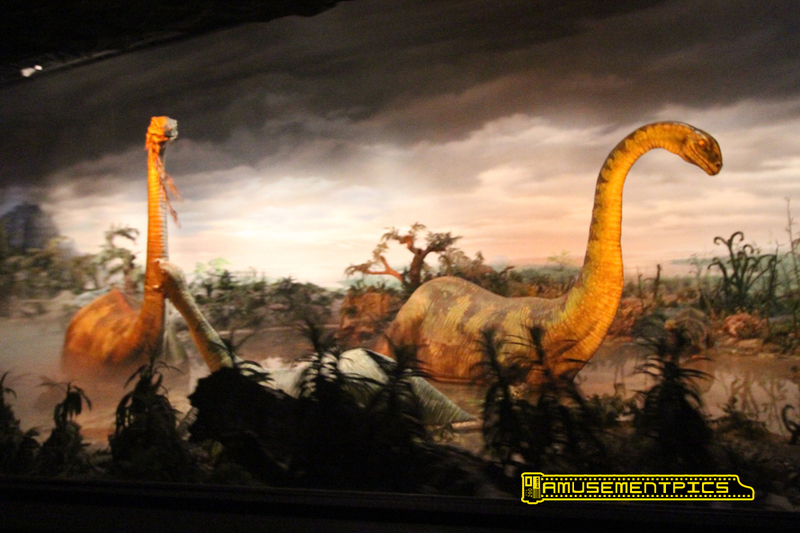 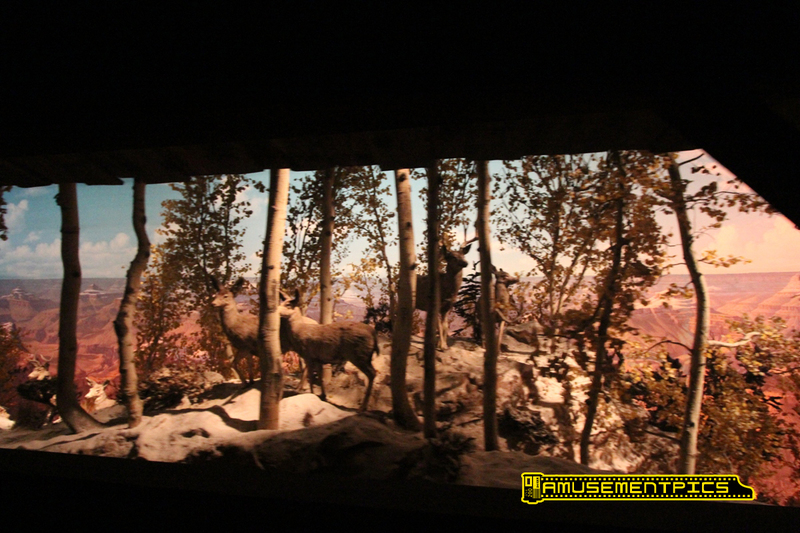 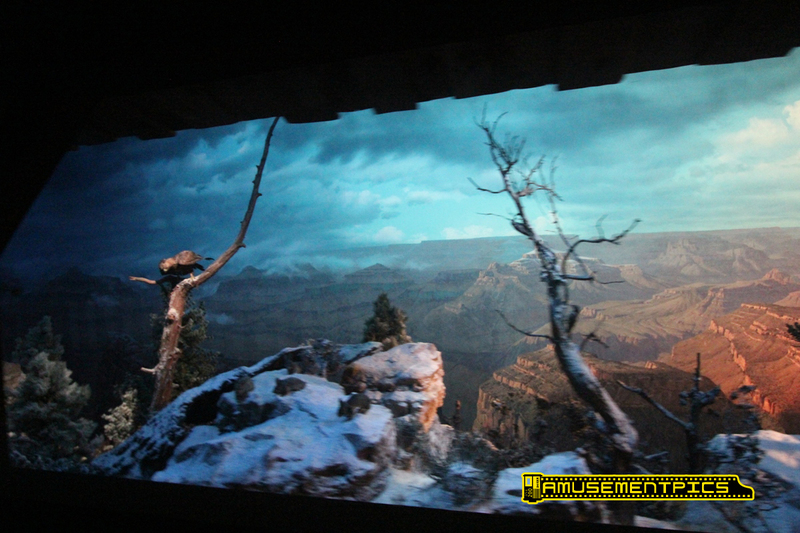 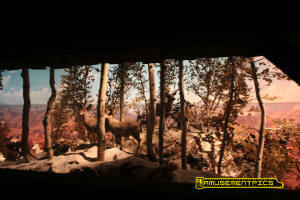 Along the way is scenery including two elaborate dioramas as well as smaller decorative vignettes representing the themed areas and animatronic animals and figures. 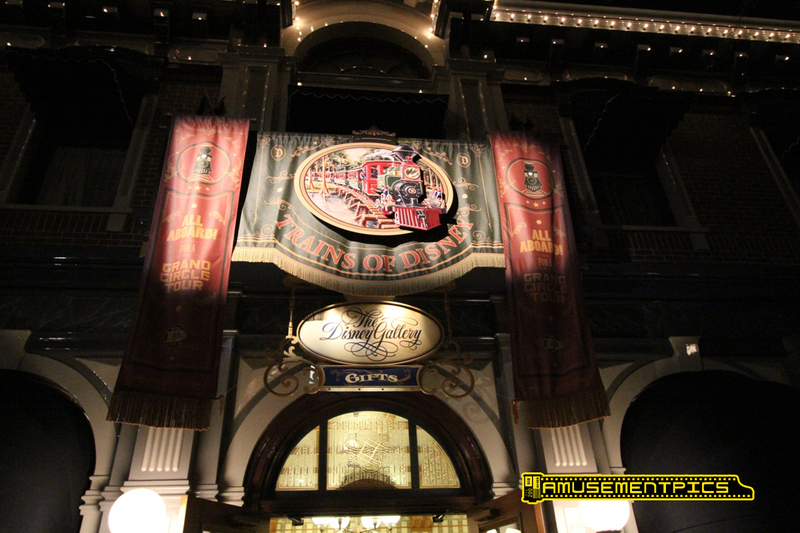 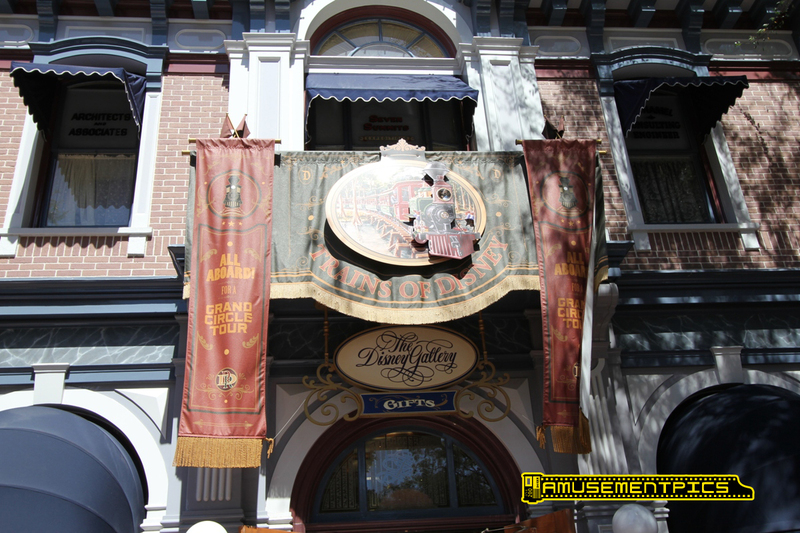 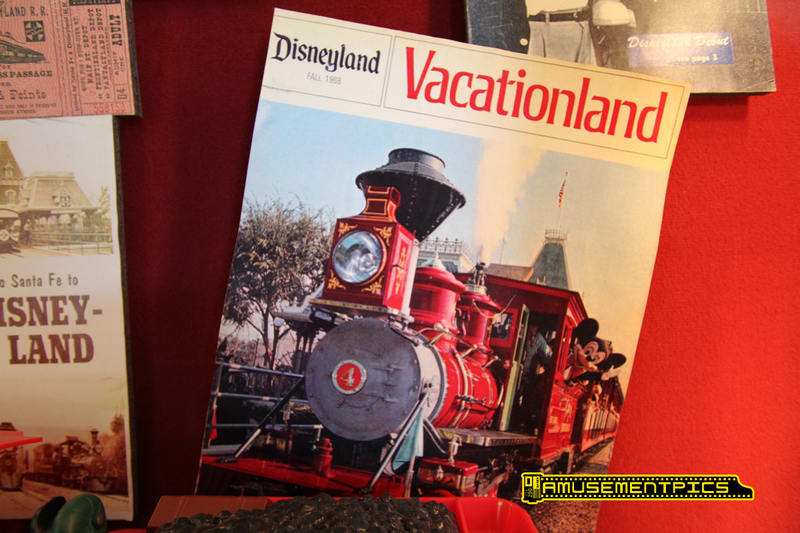 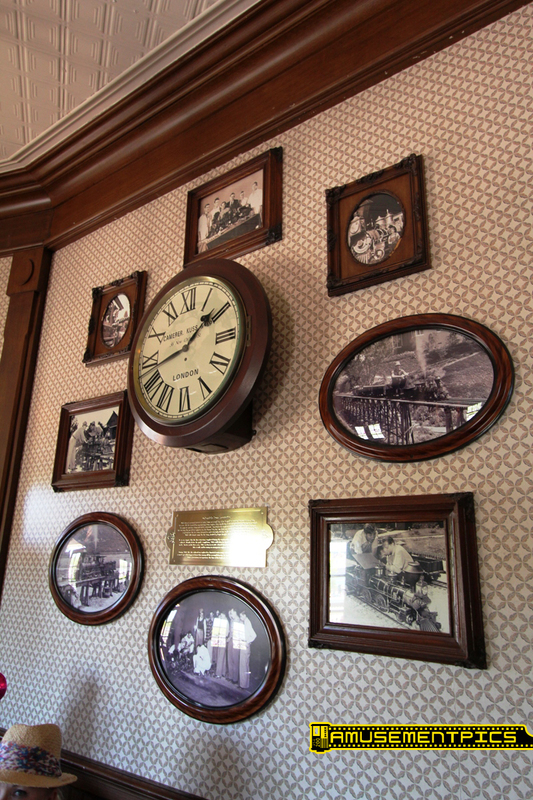 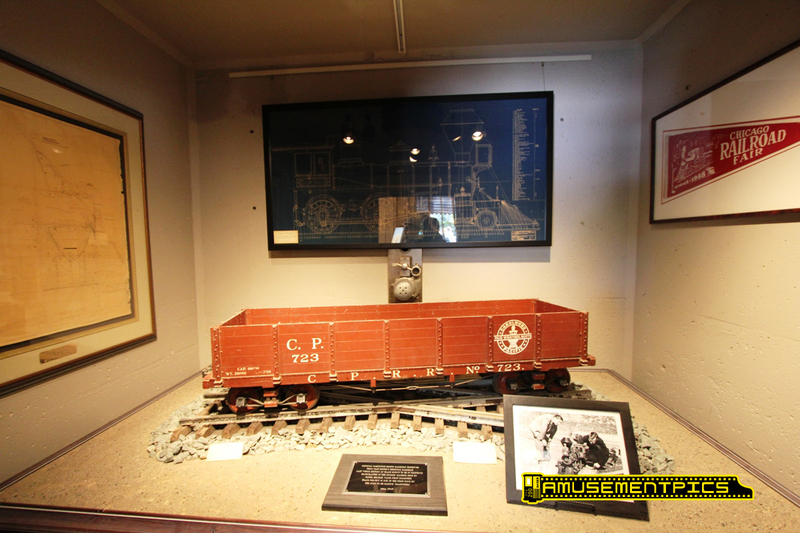 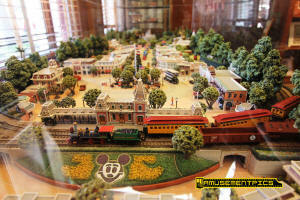 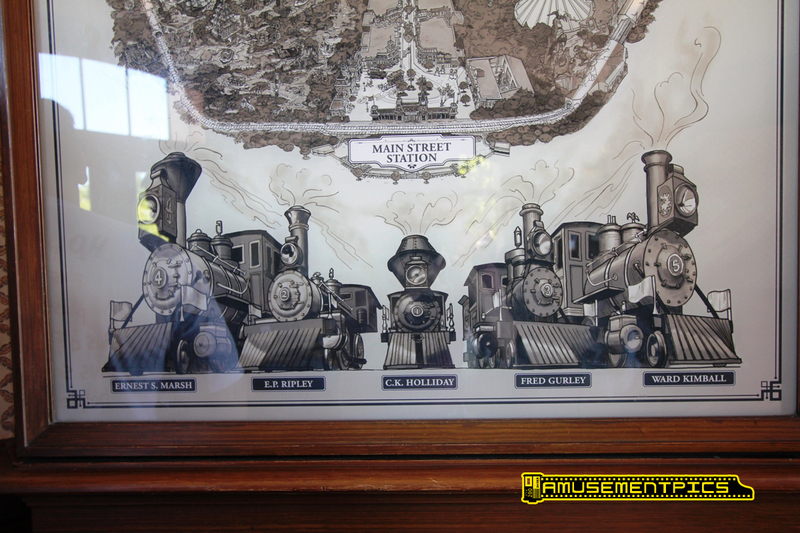 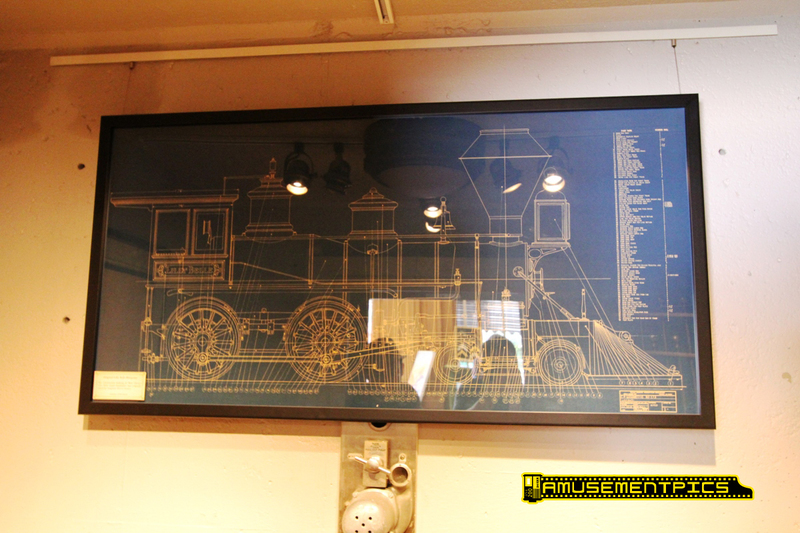 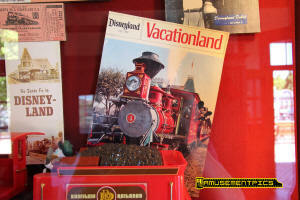 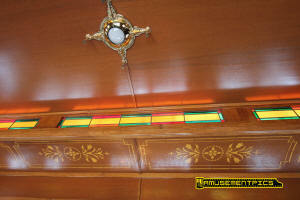 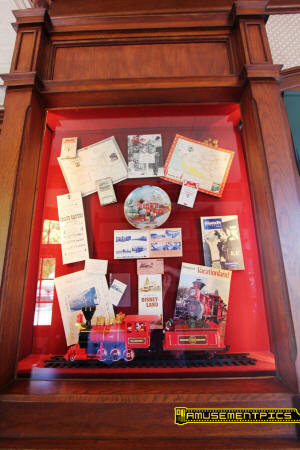 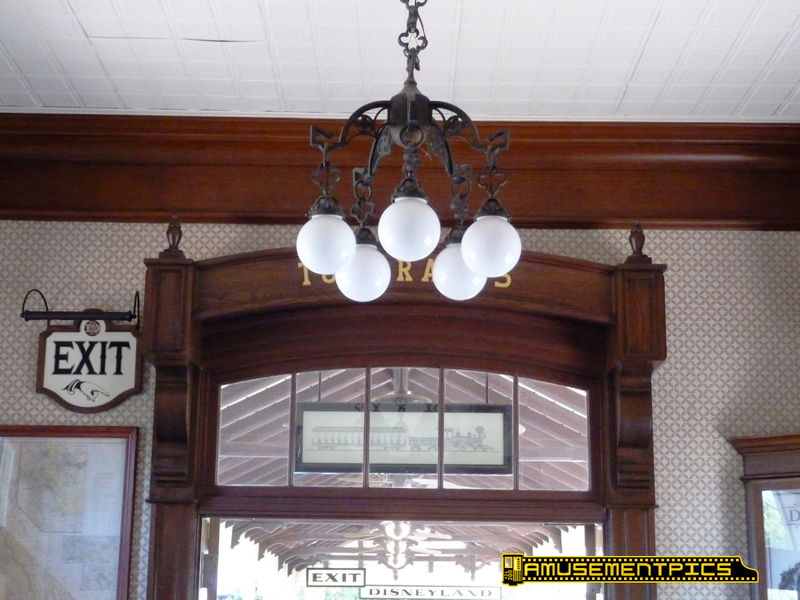 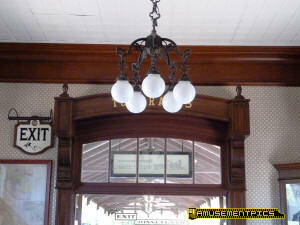 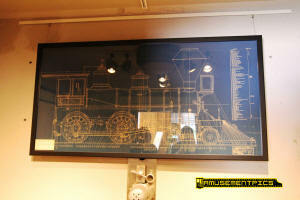 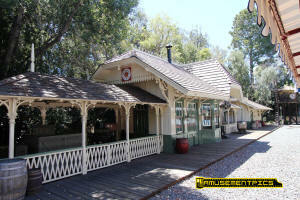 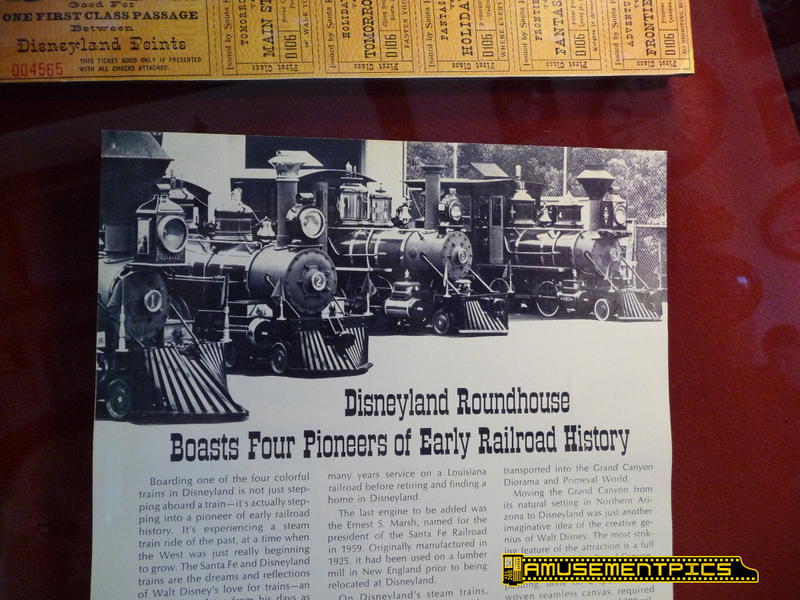 The history of the Railroad is presented in the Main Street Station as well as in a gallery on Main Street. 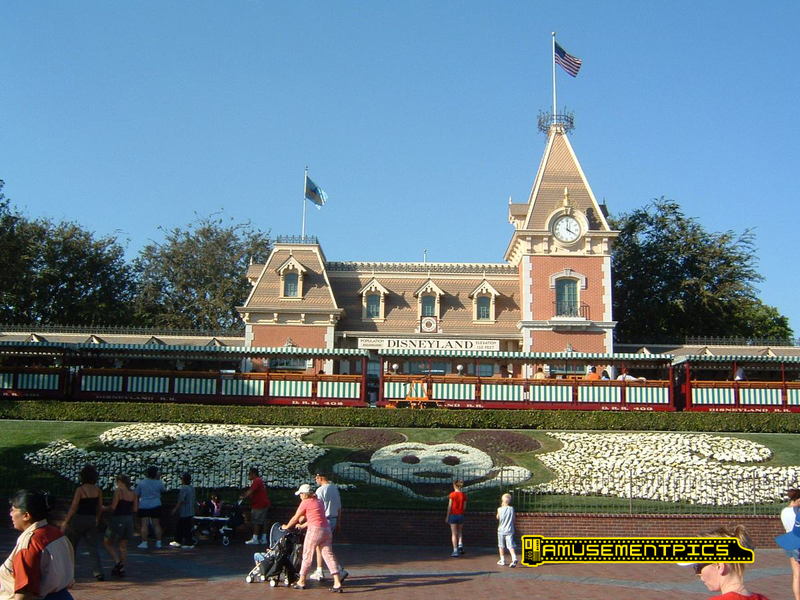 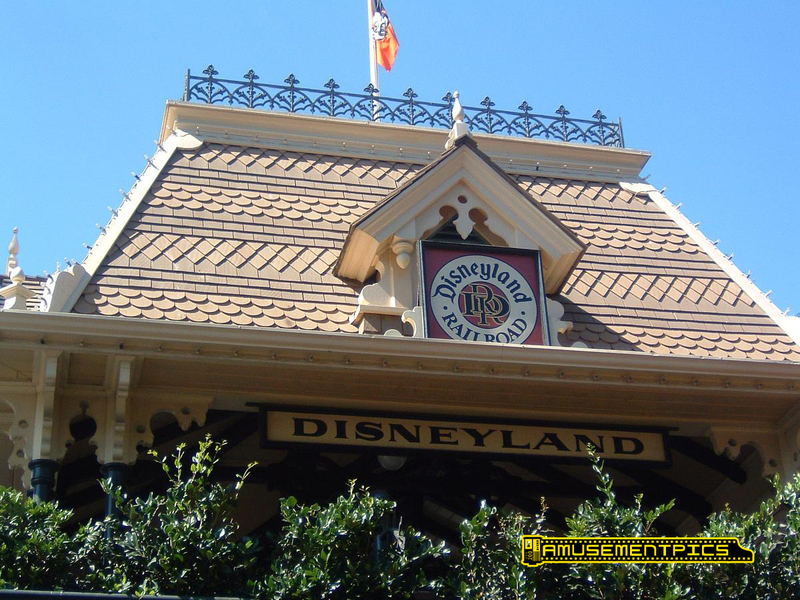 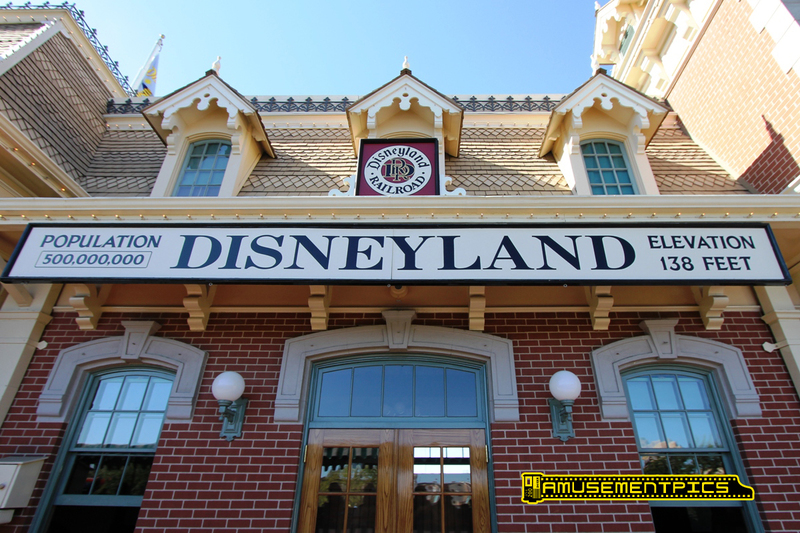 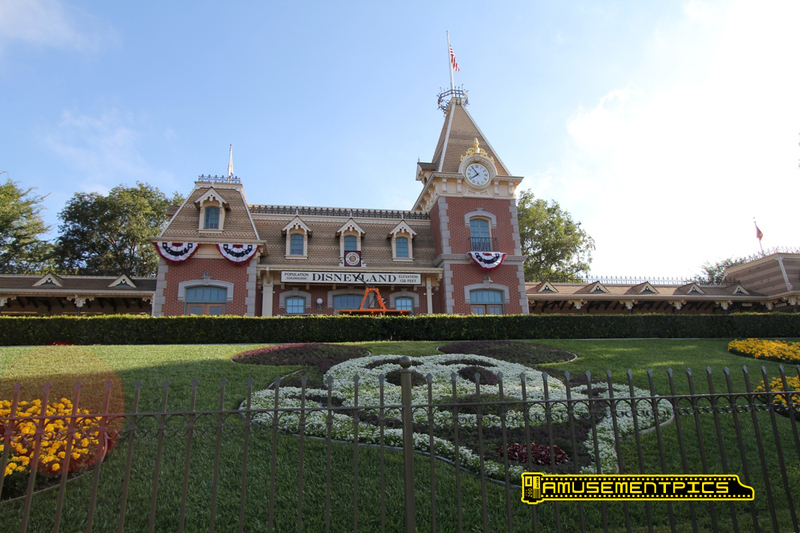 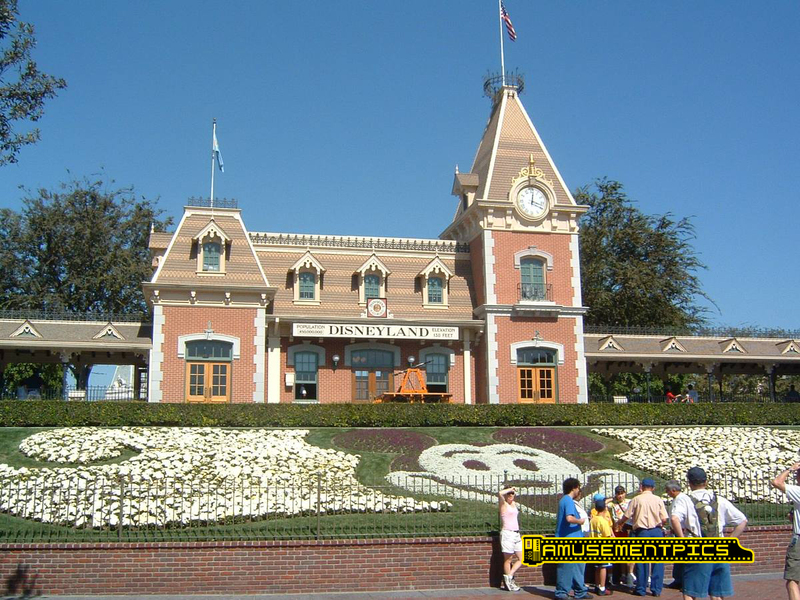 One of the most iconic images in the world is the entrance to Disneyland with its signature train station sitting high above the entrance gates. 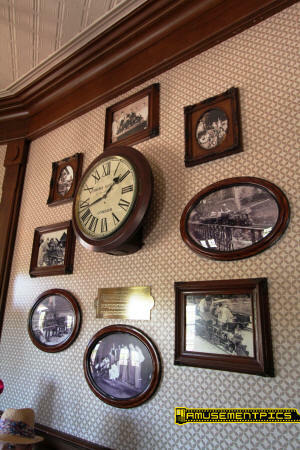 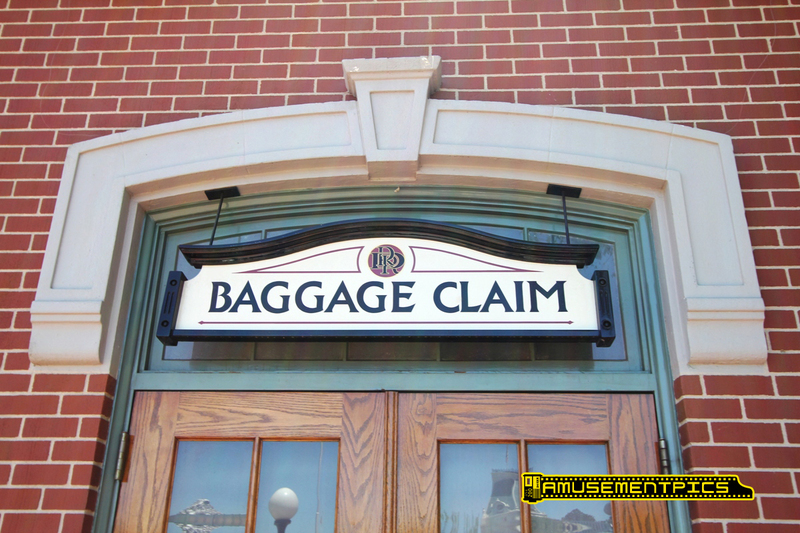 The station sits at the foot of Main Street USA and is designed to reflect the turn of the American small towns of the early twentieth century like the rest of Main Street. 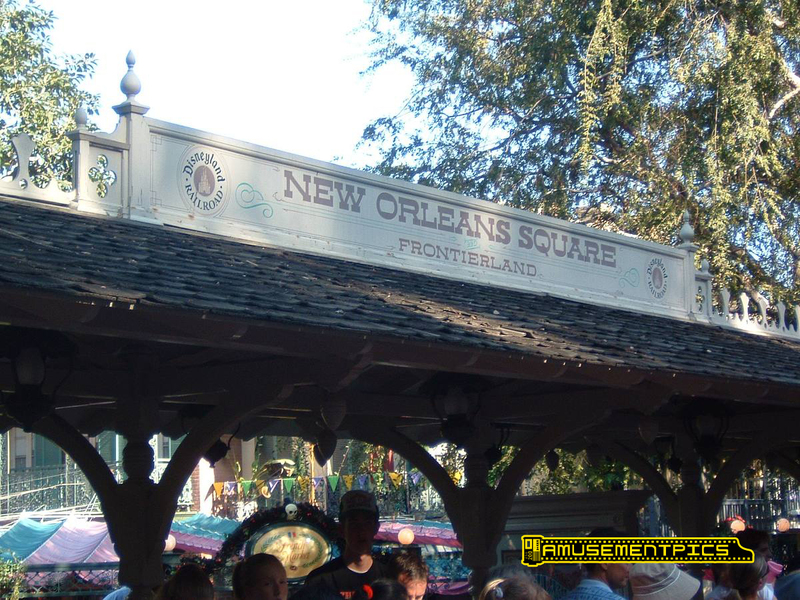 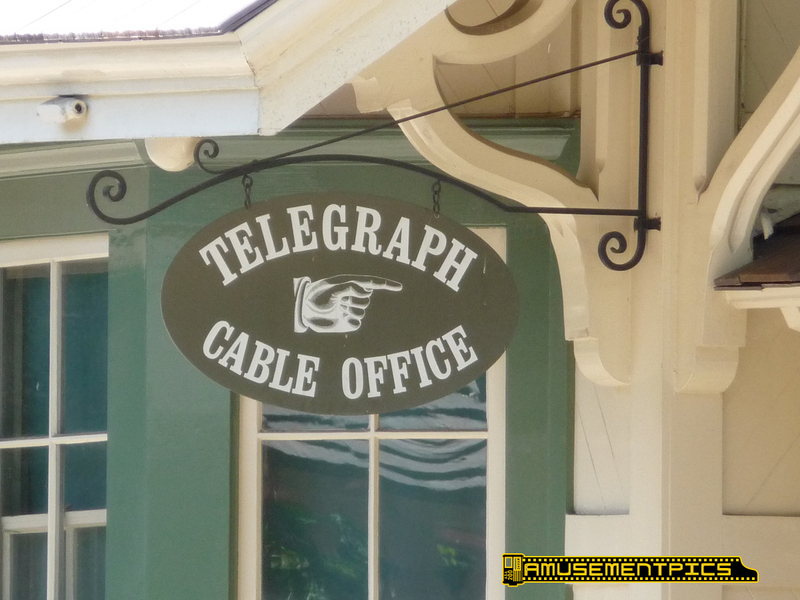 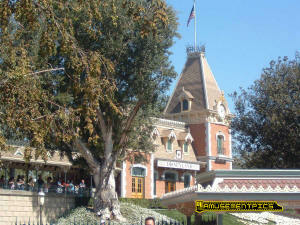 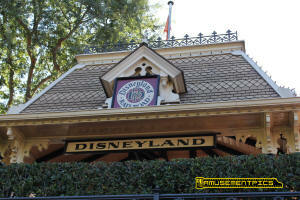 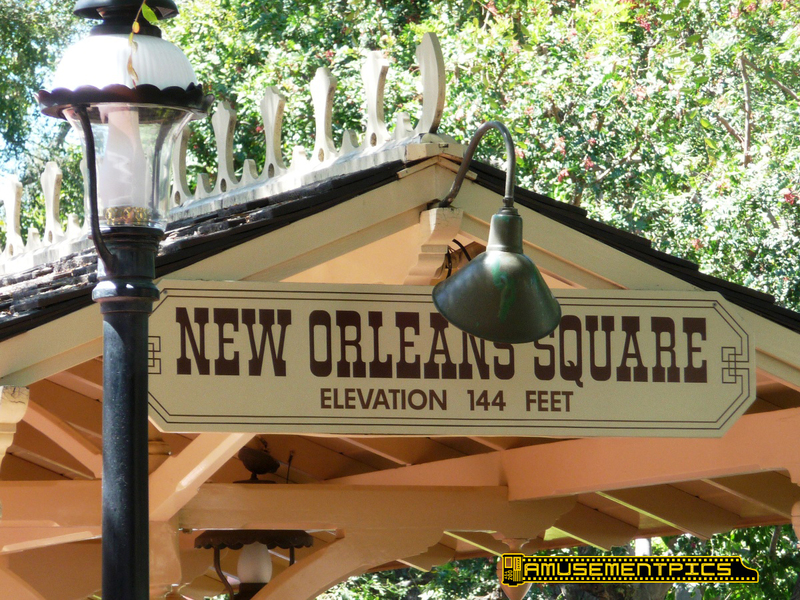 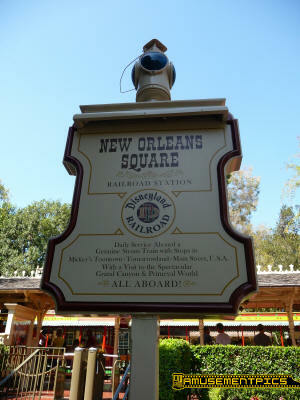 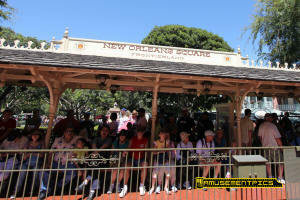 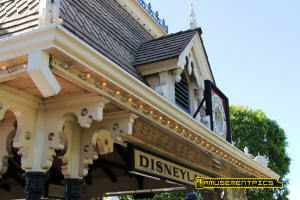 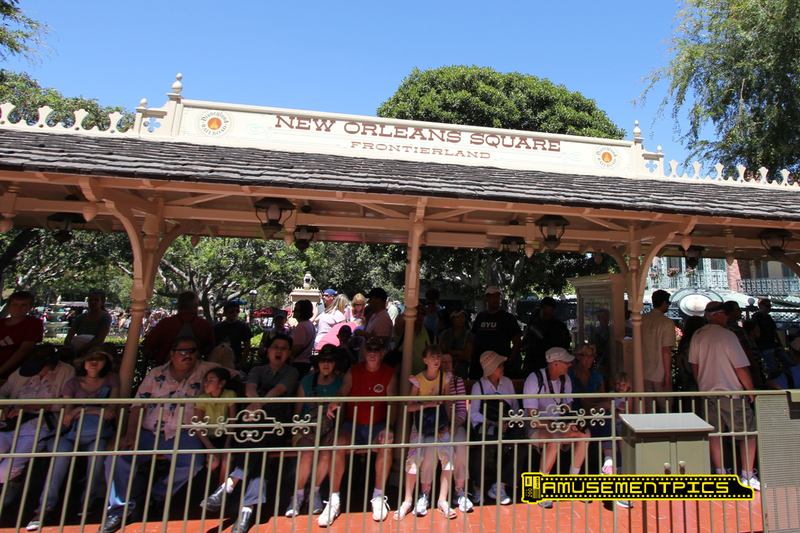 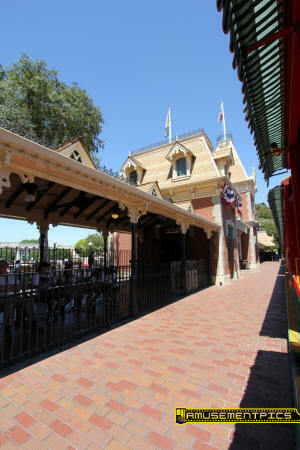 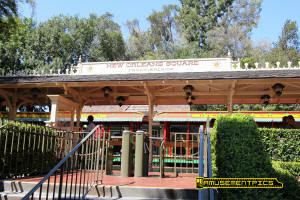 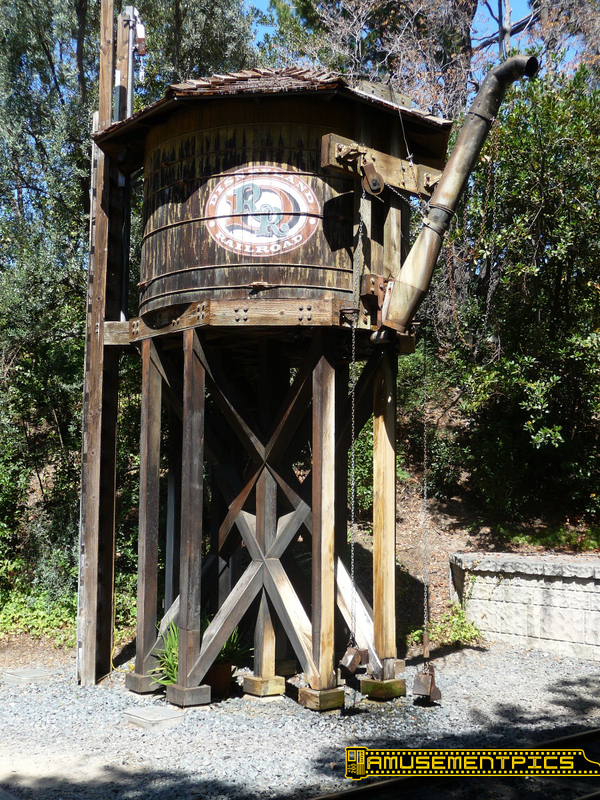 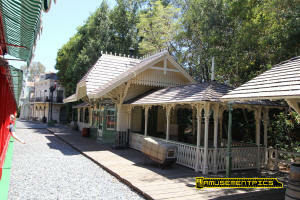 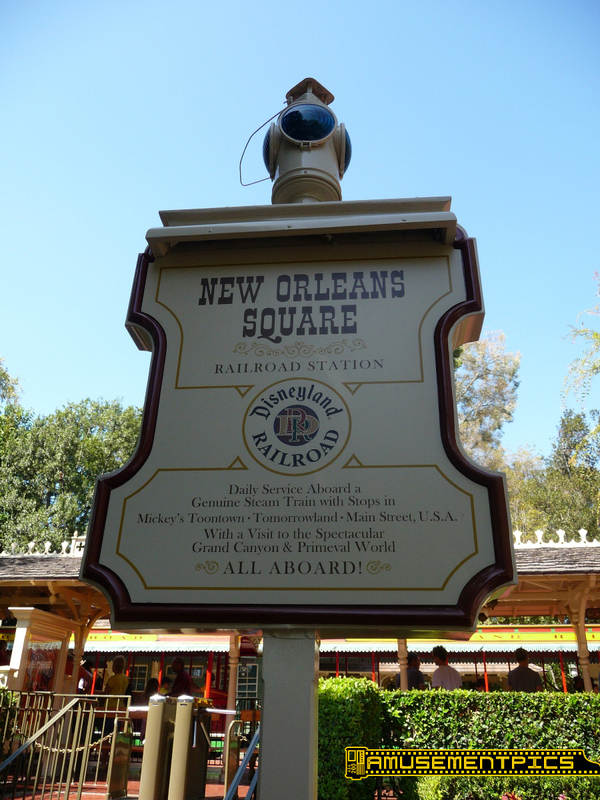 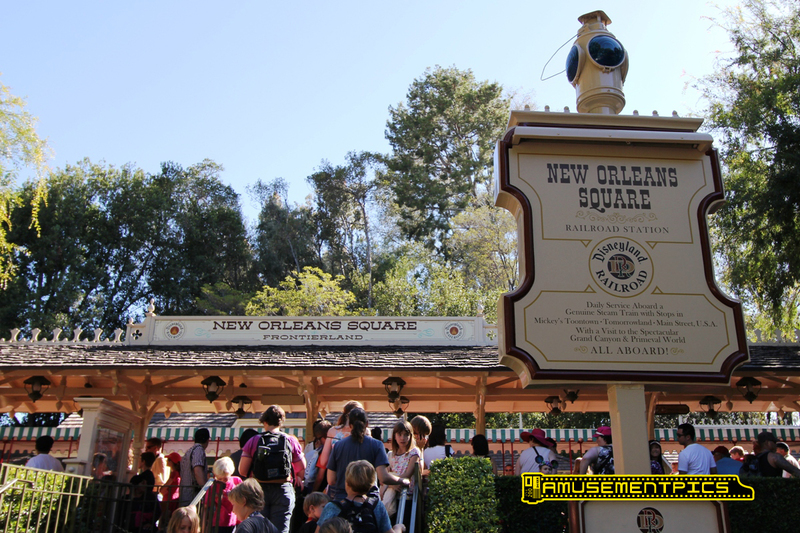 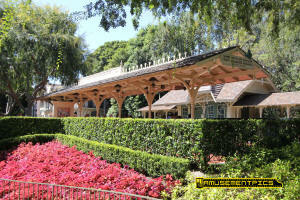 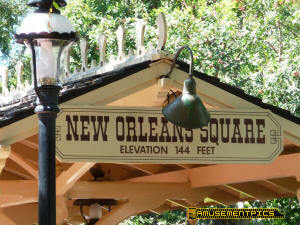 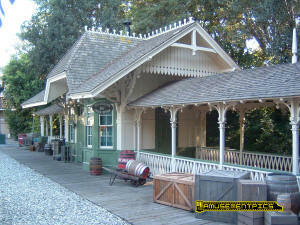 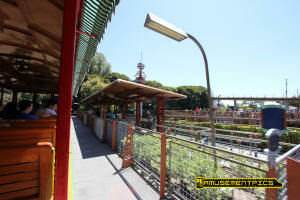 Along the edge of New Orleans Square, the station serves Frontierland and Critter Country as well. The simple station building is on the opposite side of the tracks from the platform, serving as a backdrop as well as for the crew's break room facilities. 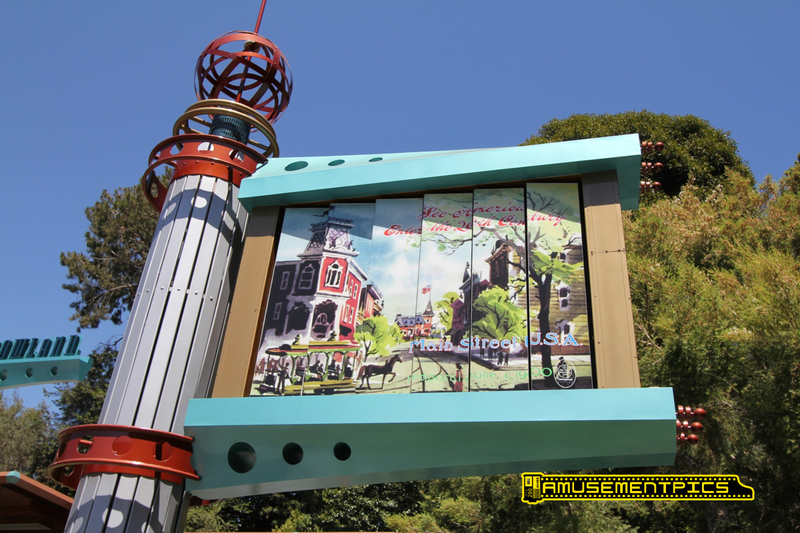 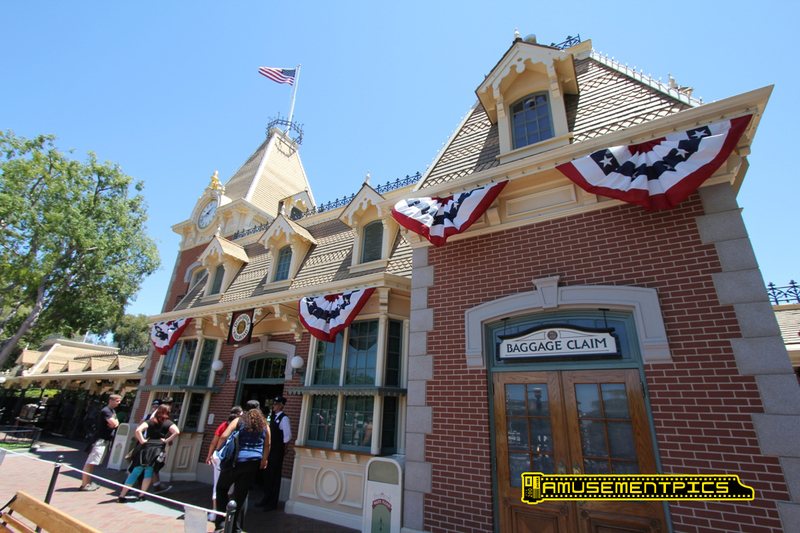 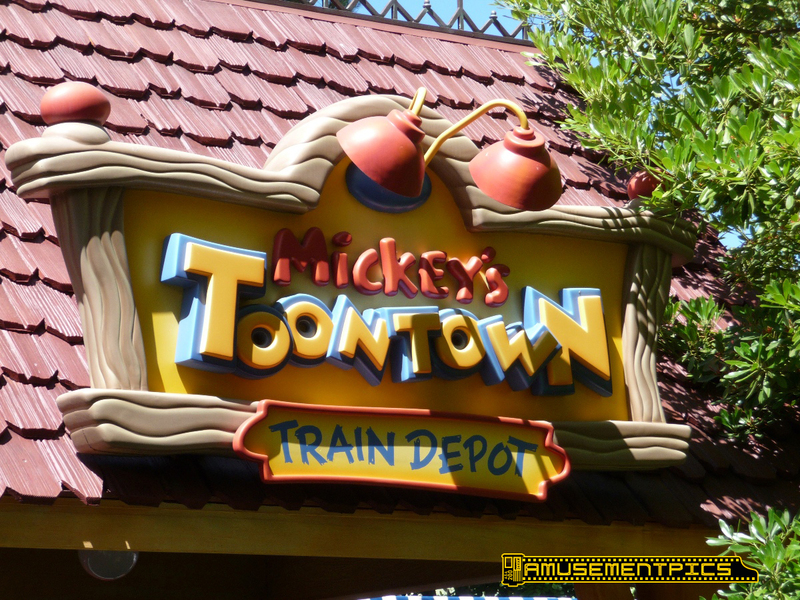 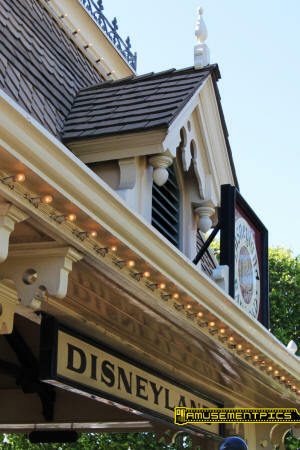 The newest of the four stations along the Disneyland Railroad is the Mickey's Toontown Station serving Toontown and Fantasyland. 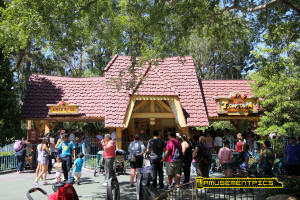 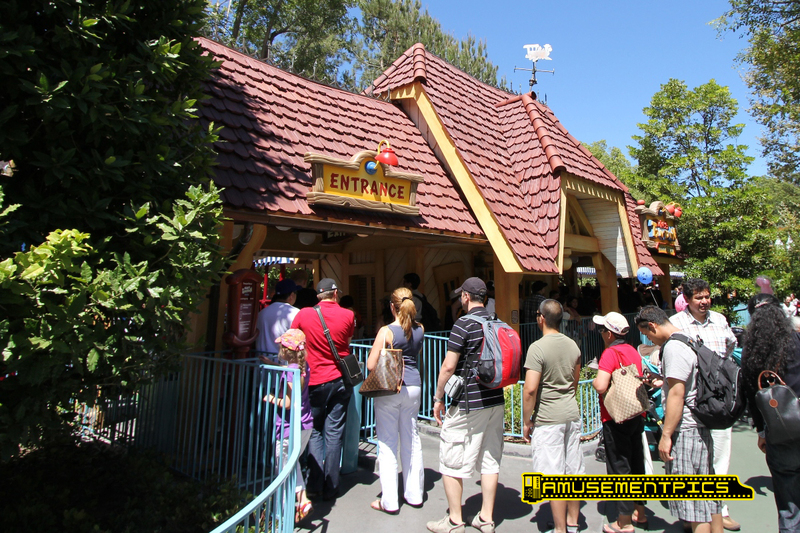 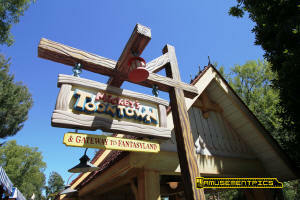 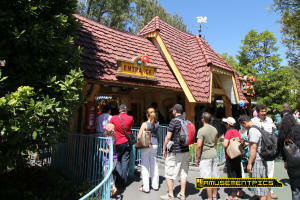 The small station combines the cartoonish lines of Toontown with the profile of the buildings of Fantasyland since it straddles the two areas. 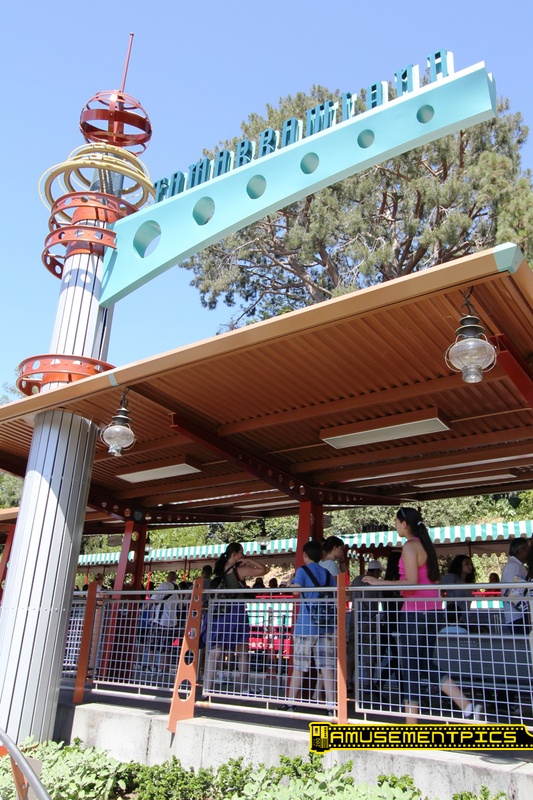 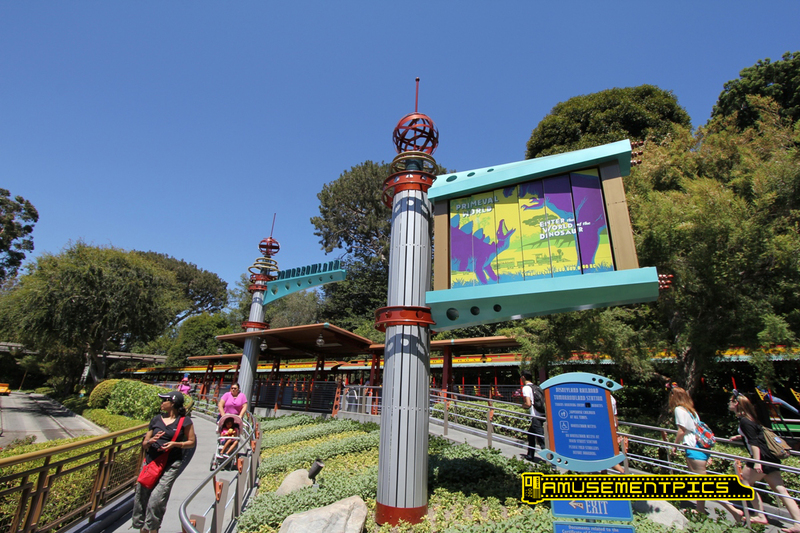 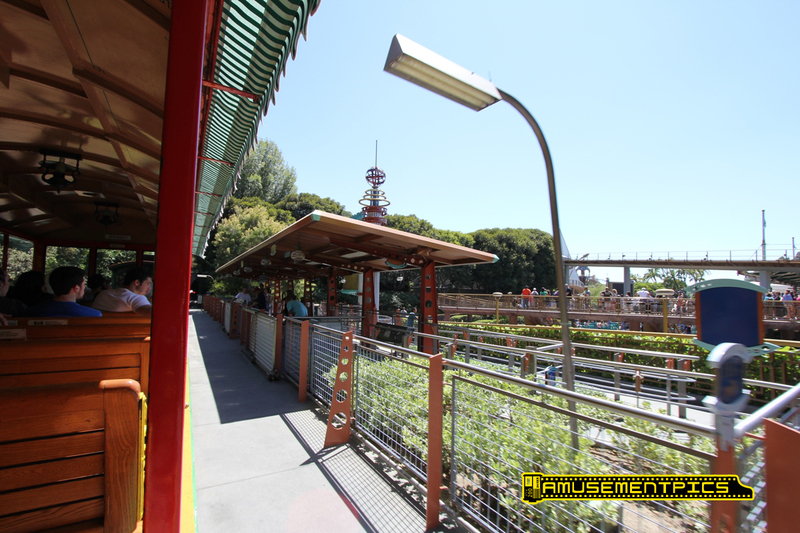 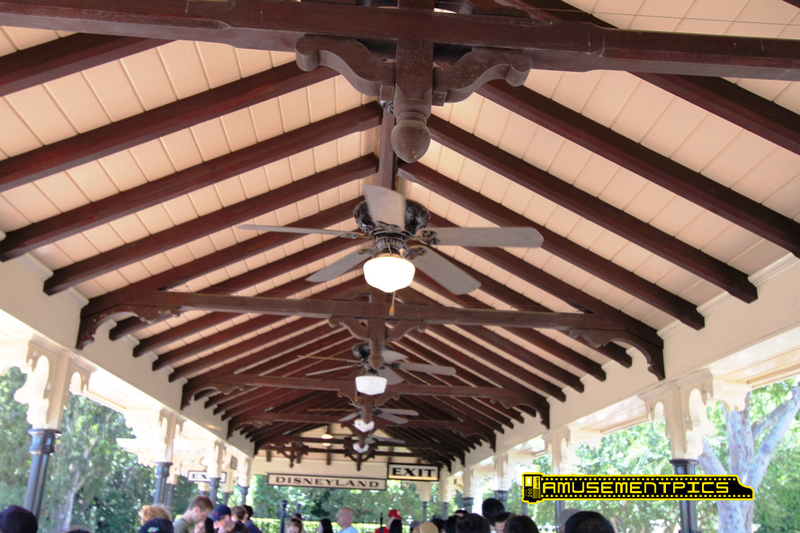 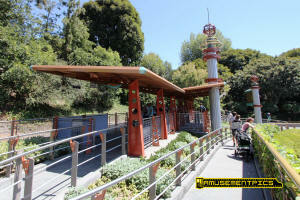 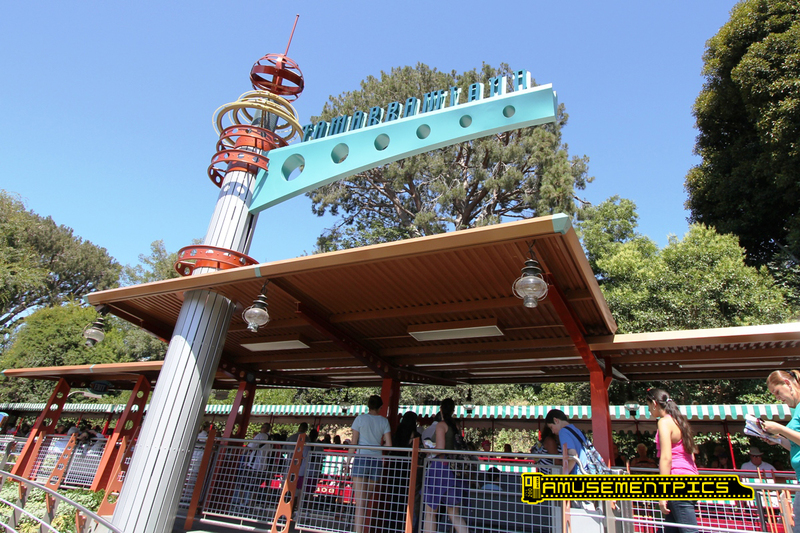 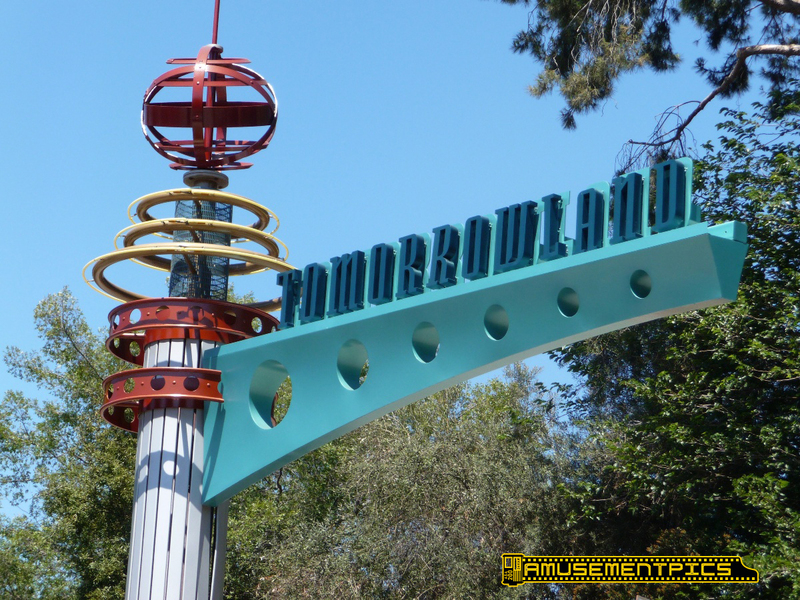 The Tomorrowland Station is the smallest and simplest of the four stations, with just a simple, angled metal roof as covering. 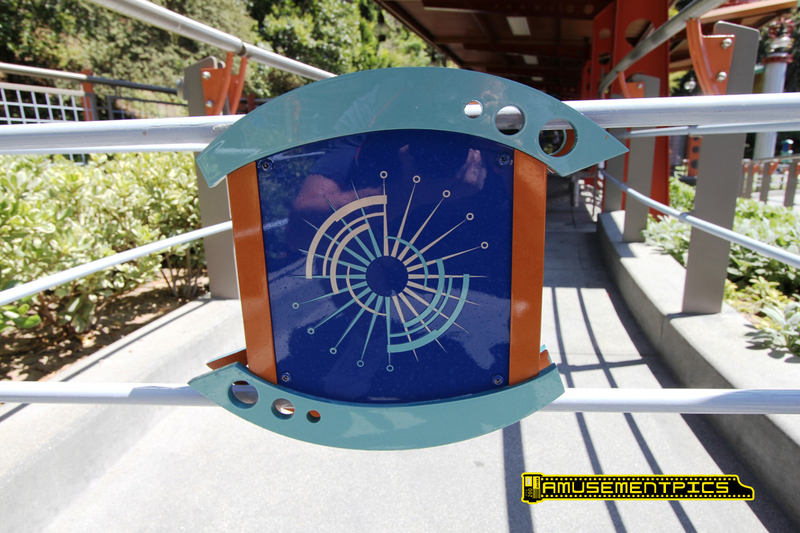 The architecture combines the modern elements of Tomorrowland with more traditional lanterns to meld the styles of the trains and area. 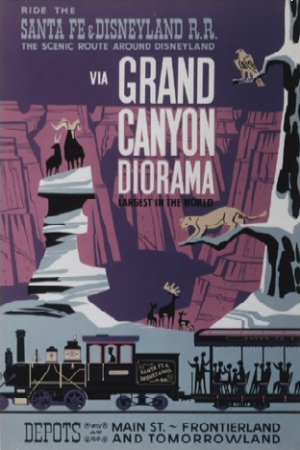 Outside a changing billboard advertises the destinations served. 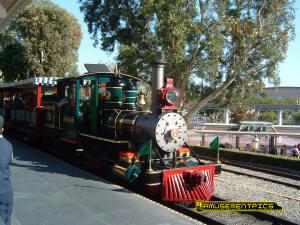 An American style 4-4-0 built by the WED Studio in 1954 that went into service at Disneyland on Opening Day, 1955. 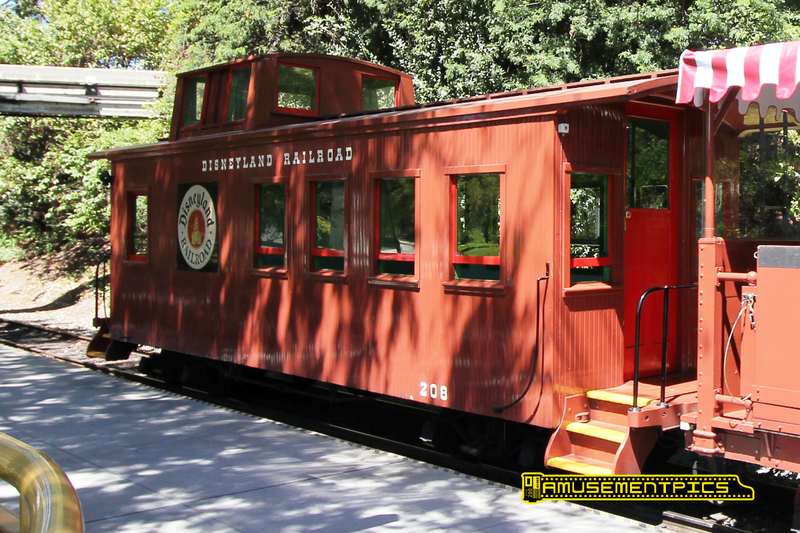 It was named for Cyrus Kurtz Holliday, founder of the Santa Fe Railroad in 1859. 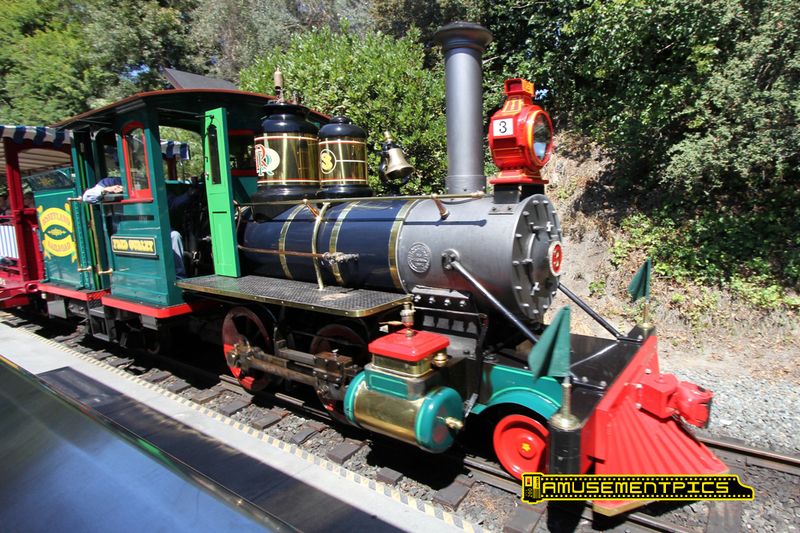 An American style 4-4-0 built by the WED Studio in 1954 that went into service at Disneyland on Opening Day, 1955. It was named for Edward Payson Ripley, an early president of the Atchison, Topeka and Santa Fe Railway. 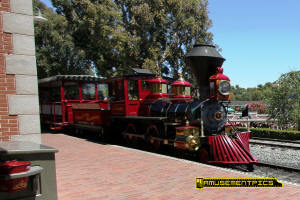 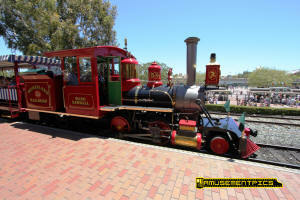 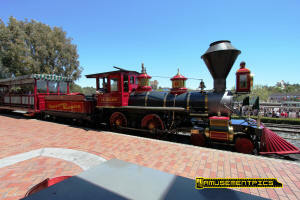 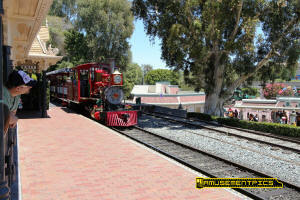 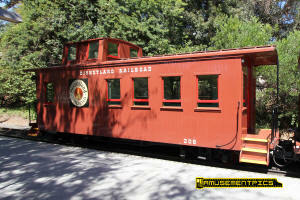 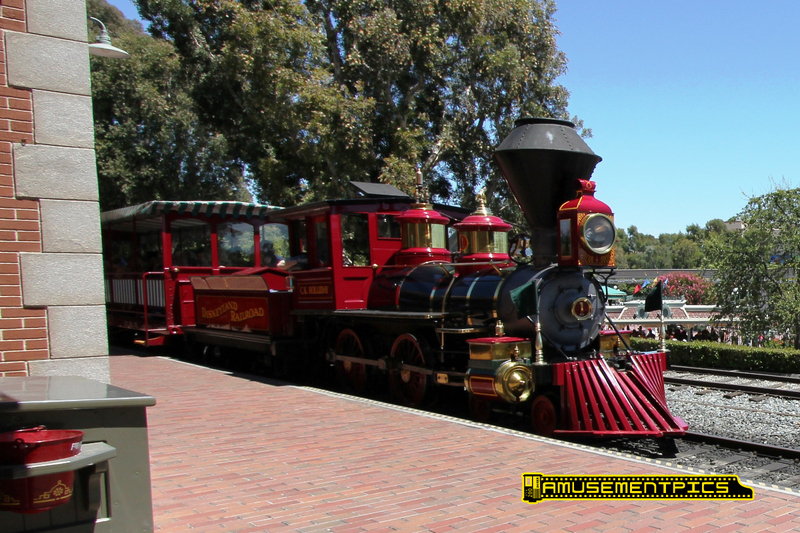 A 2-4-4 built by Baldwin Locomotive Works in 1894 that went into service at Disneyland in 1958. 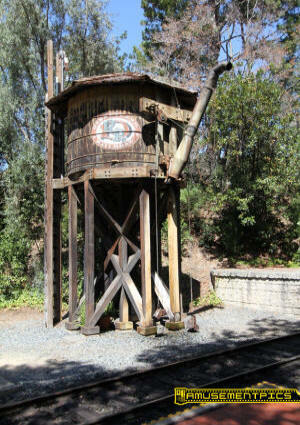 The locomotive, named for the then-current chairman of the ATSF, Fred G. Gurley, is the oldest single piece of railroad equipment in use at any Disney theme park. 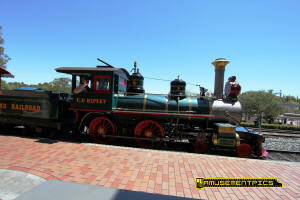 The locomotive was originally used in Louisiana to transport sugar cane. A 2-4-0 originally built by Baldwin Locomotive Works as a 0-4-0 saddle-tank in 1925; went into service at Disneyland in 1959. 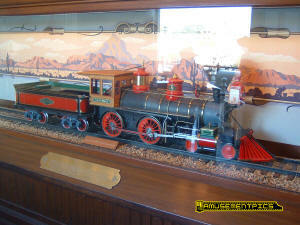 It was named for the Santa Fe's then-current president. 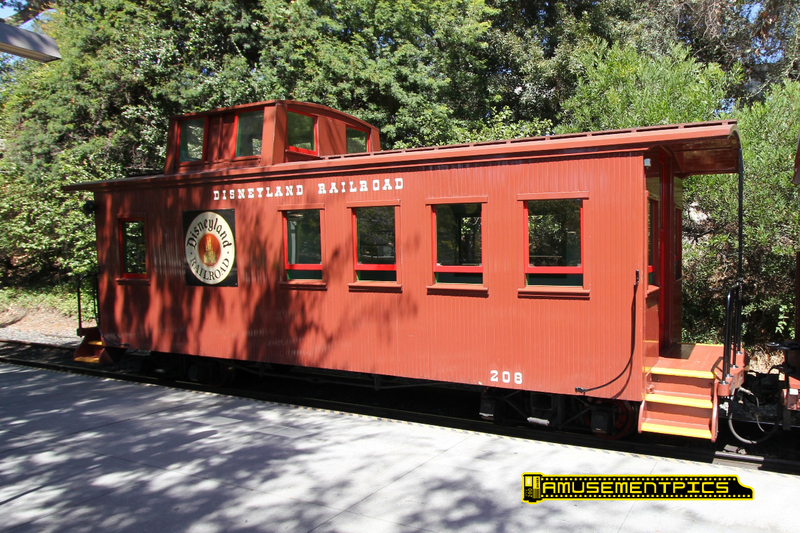 The locomotive originally served the Raritan River Sand Company in New Jersey before it was purchased and used by the Pine Creek Railroad. 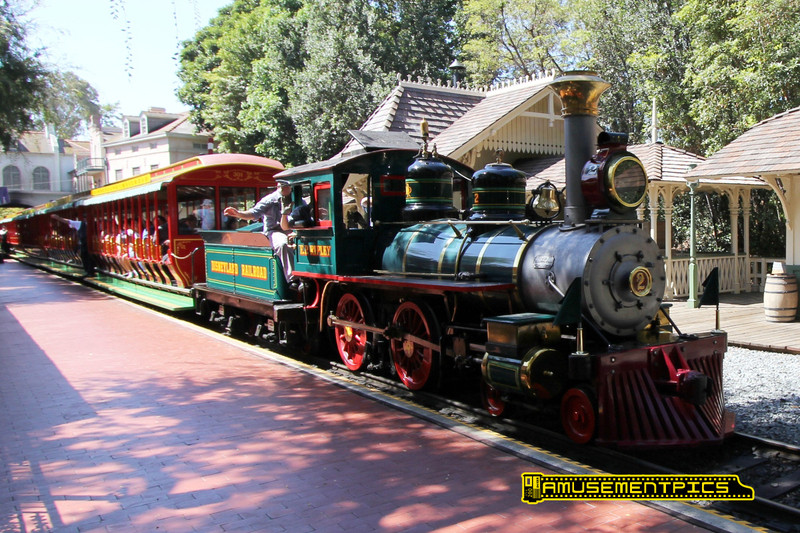 A 2-4-4, built by Baldwin Locomotive Works in 1902 for the Laurel Valley Plantation of Louisiana and later received in trade from Cedar Point Amusement Park as the Maud L in 1999. 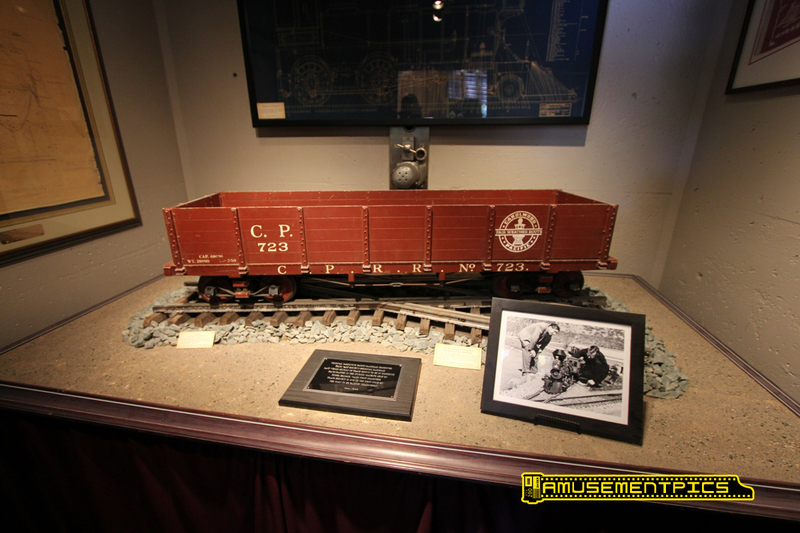 Cedar Point added a lead truck during its service there, making it a 2-4-4T. 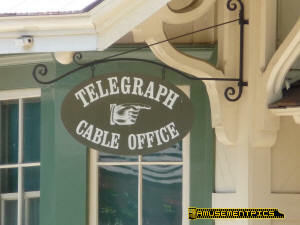 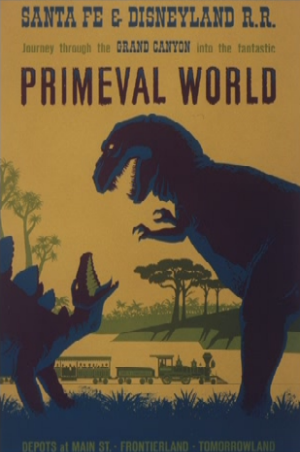 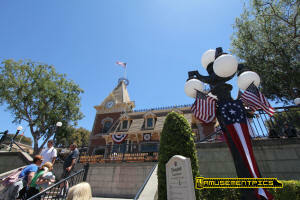 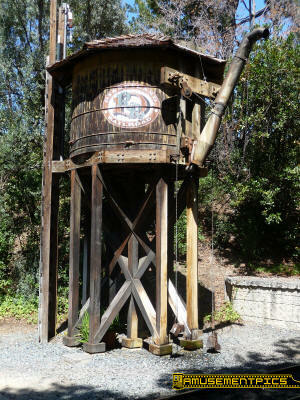 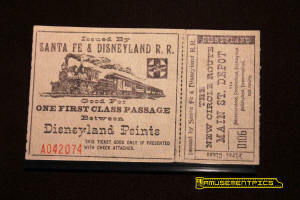 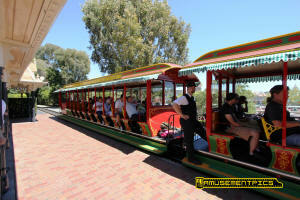 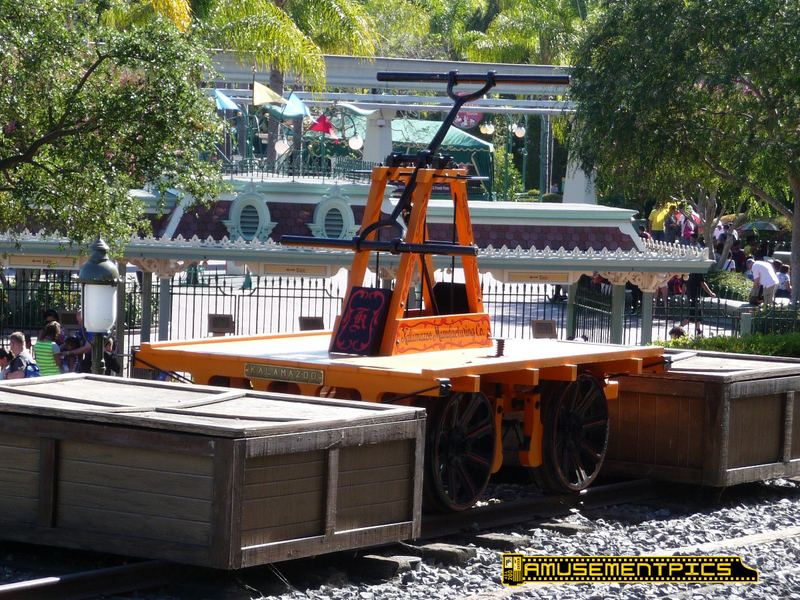 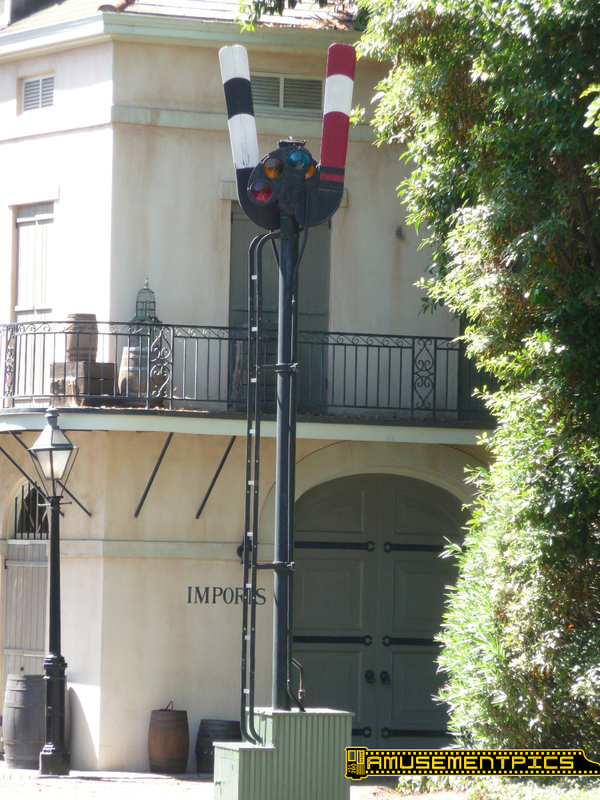 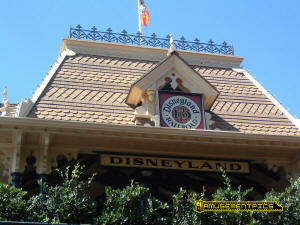 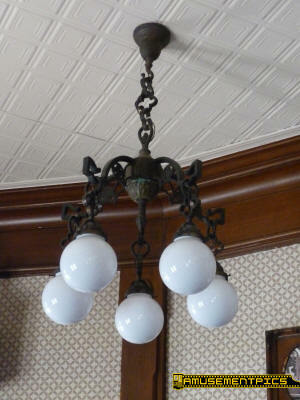 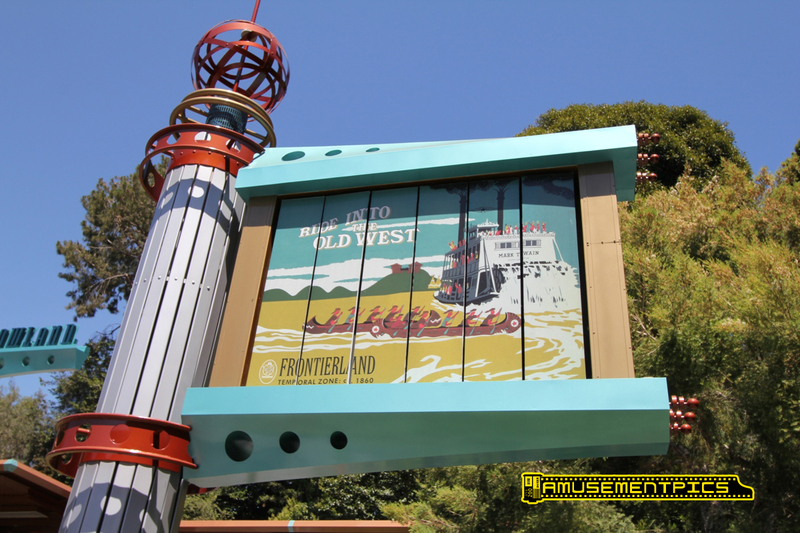 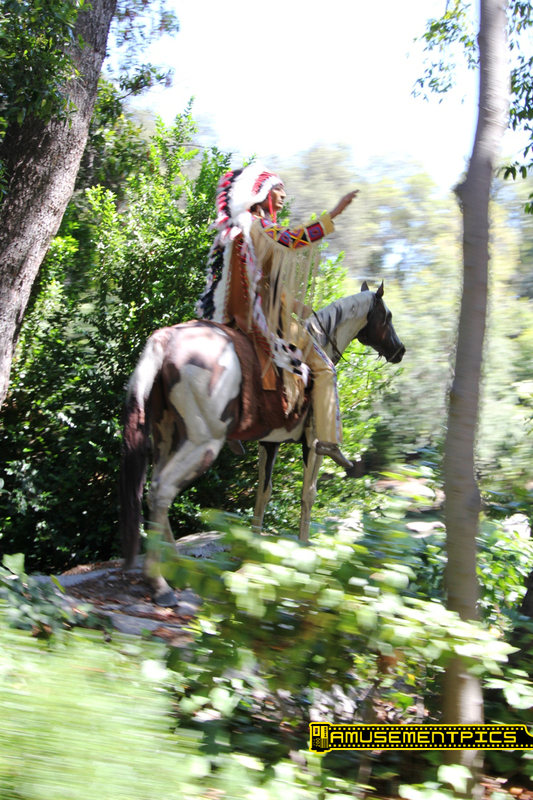 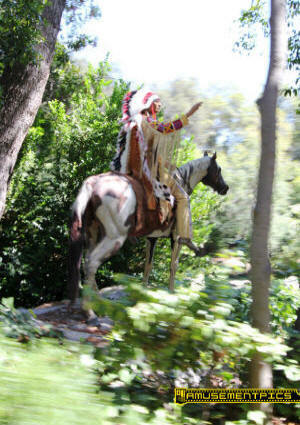 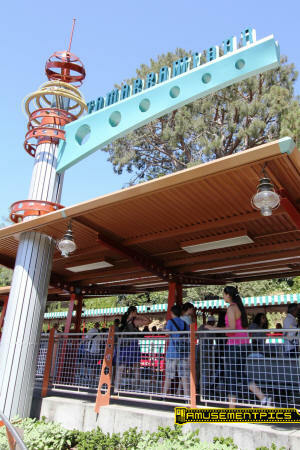 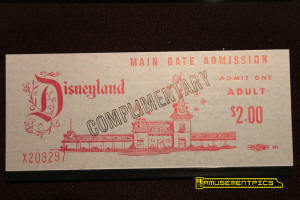 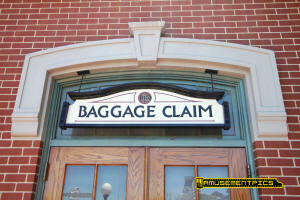 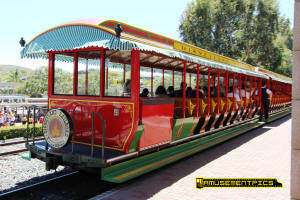 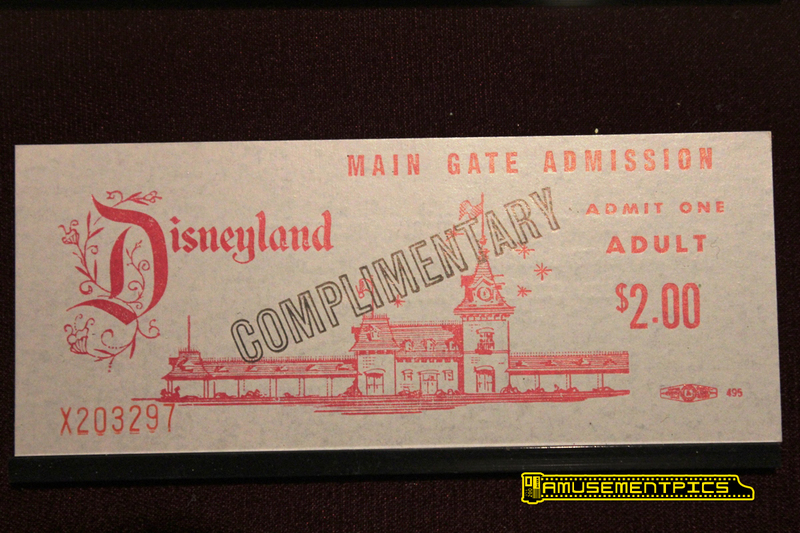 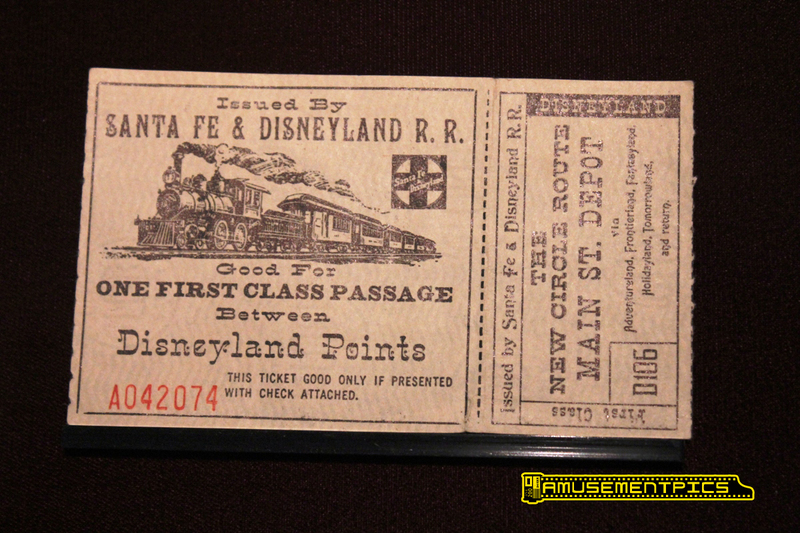 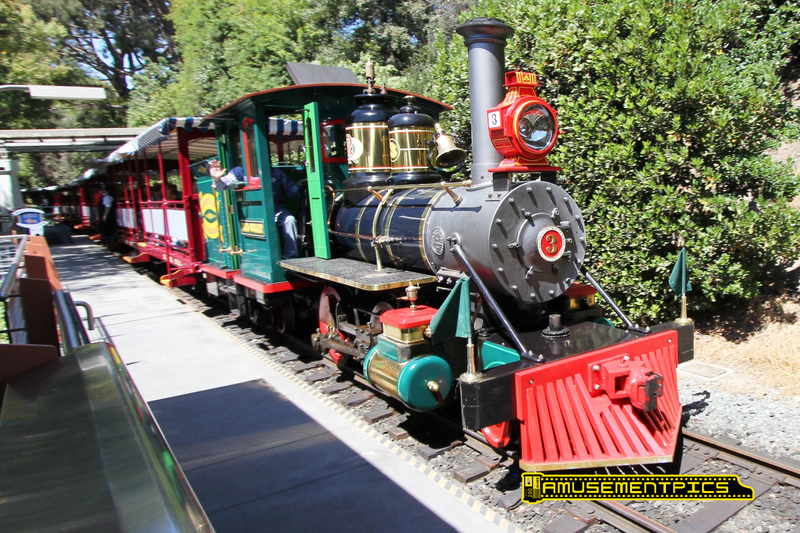 It went into service at Disneyland in 2005, as part of the park's 50th anniversary celebration. 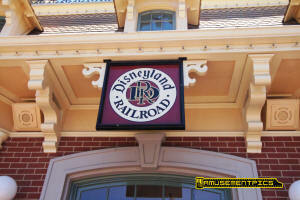 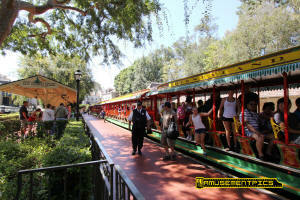 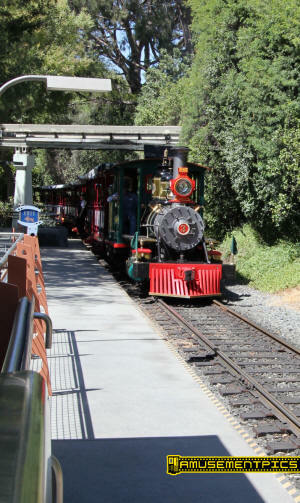 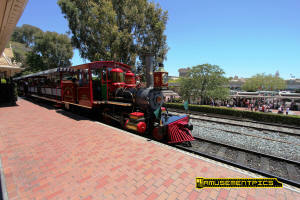 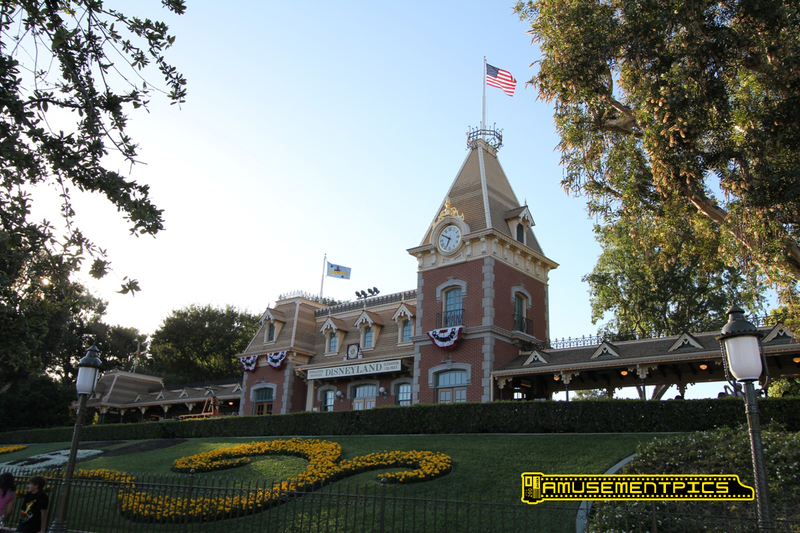 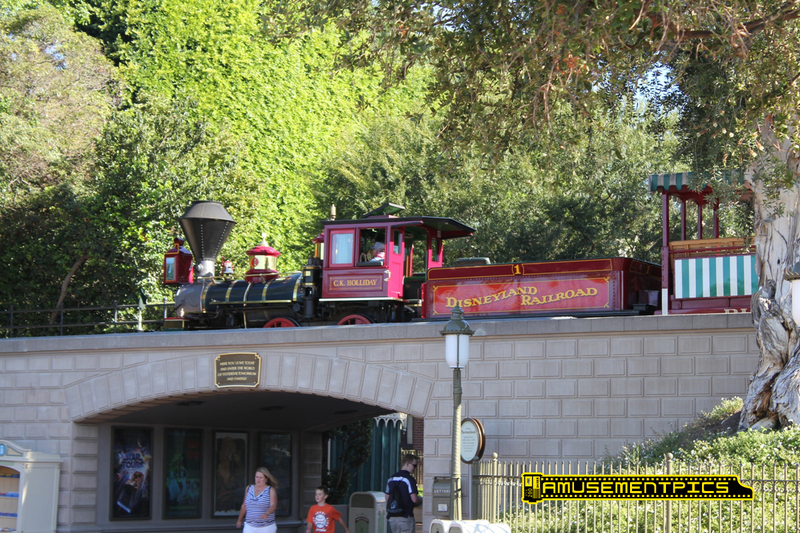 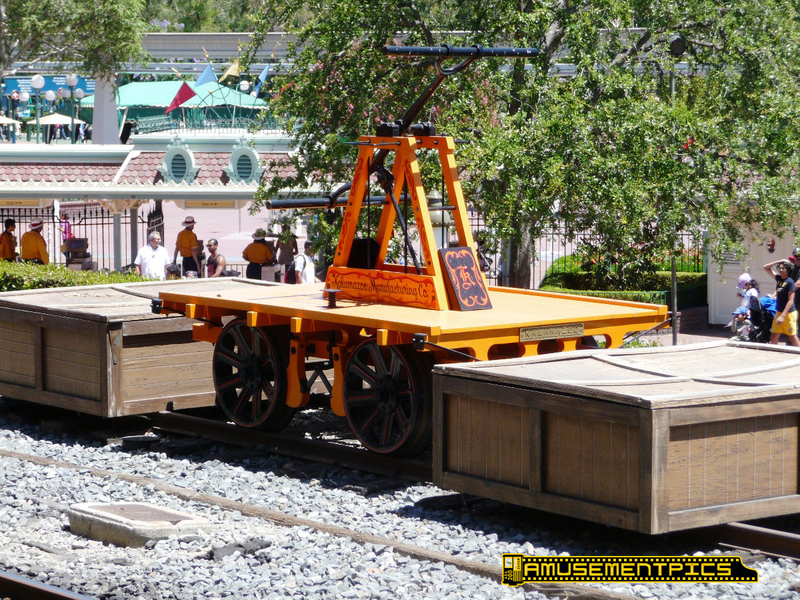 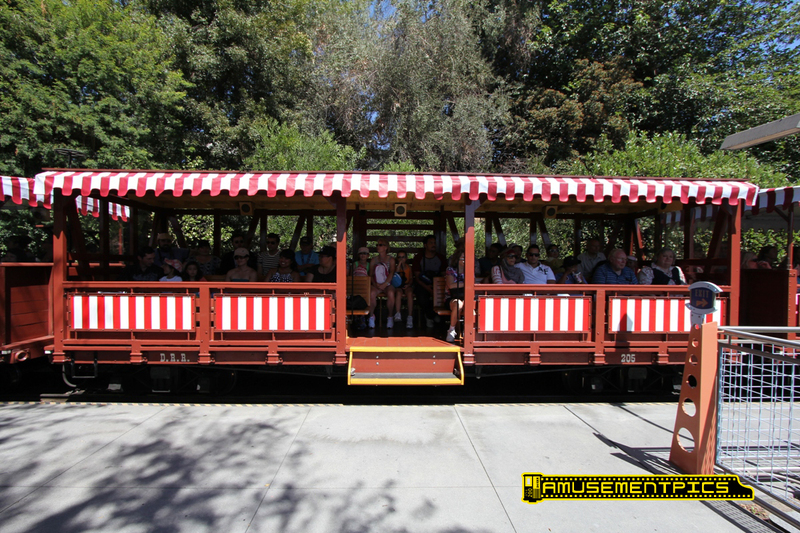 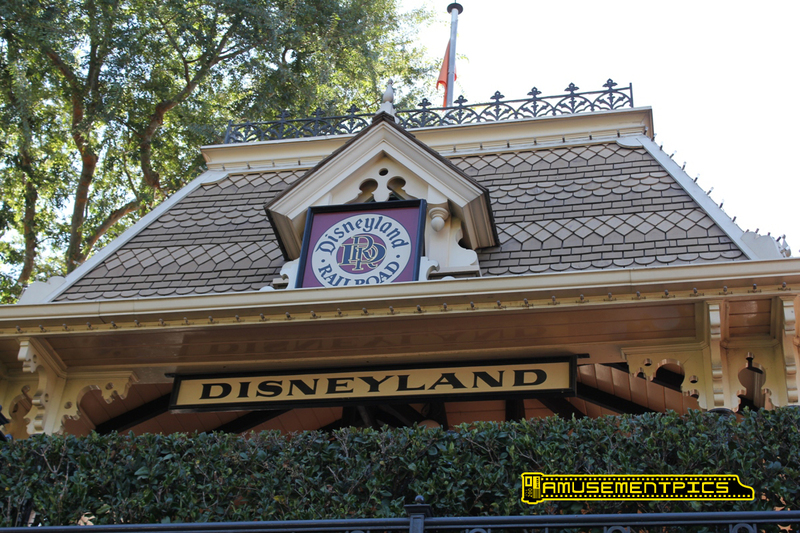 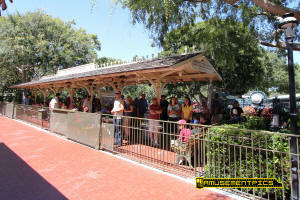 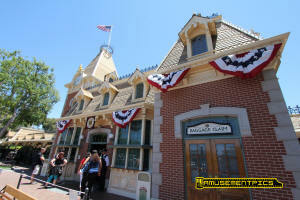 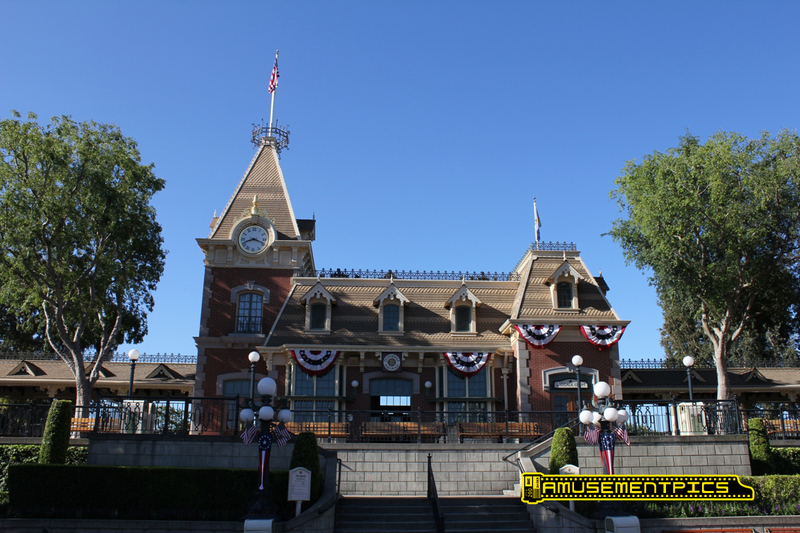 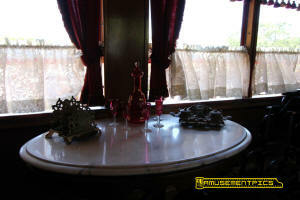 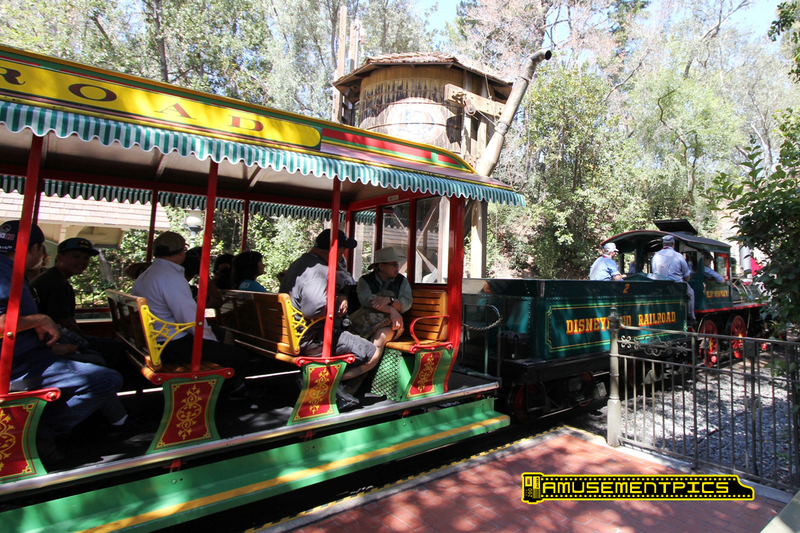 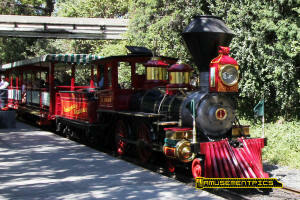 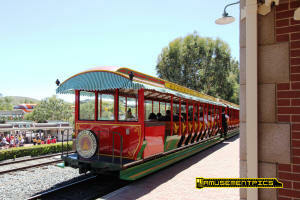 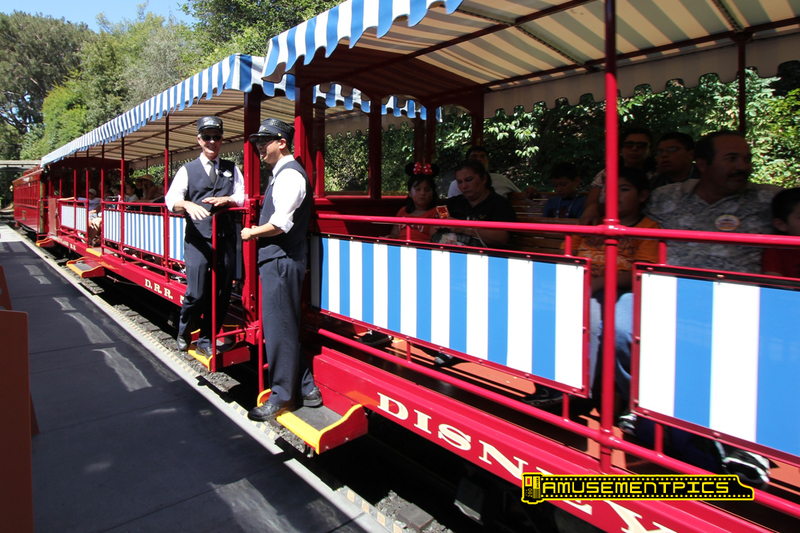 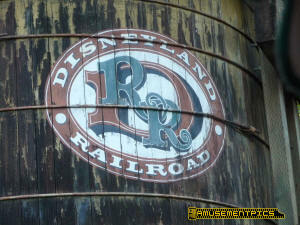 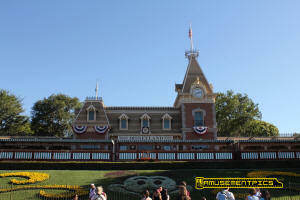 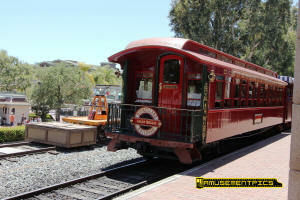 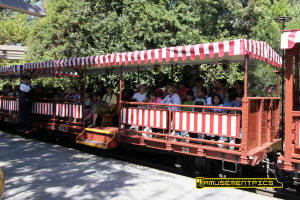 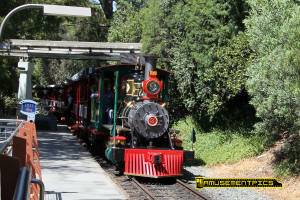 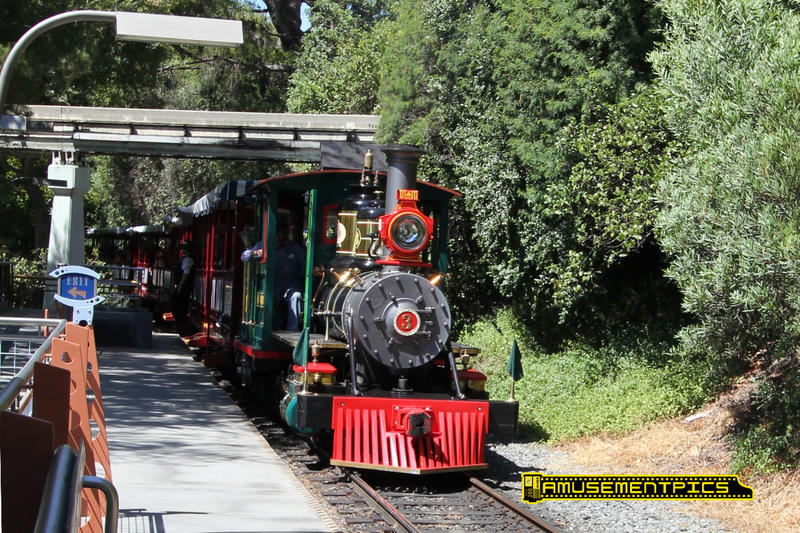 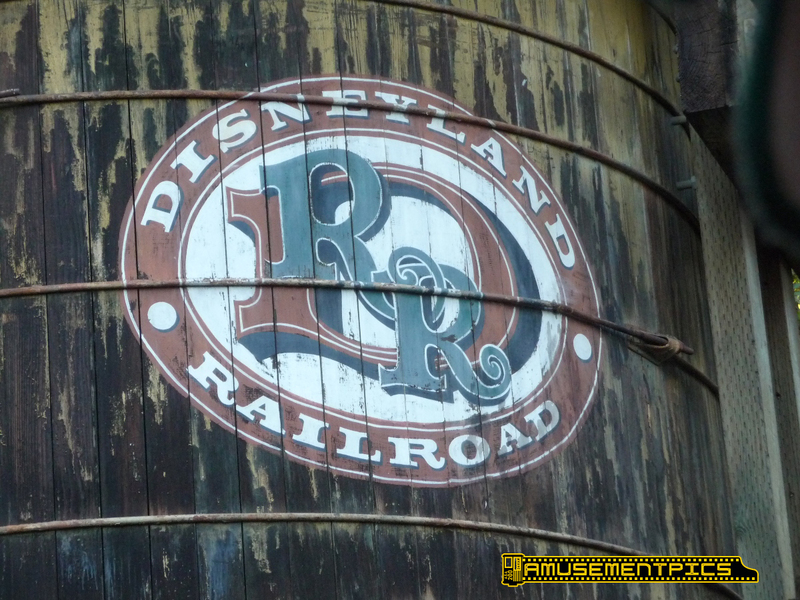 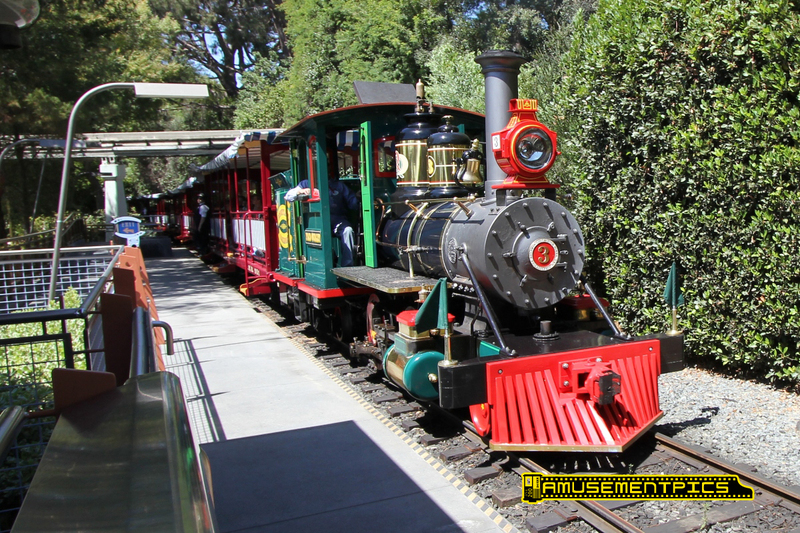 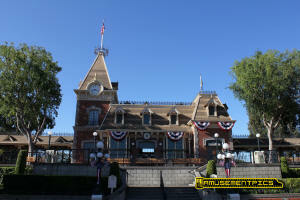 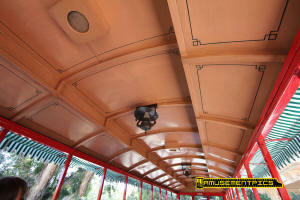 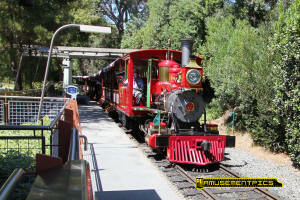 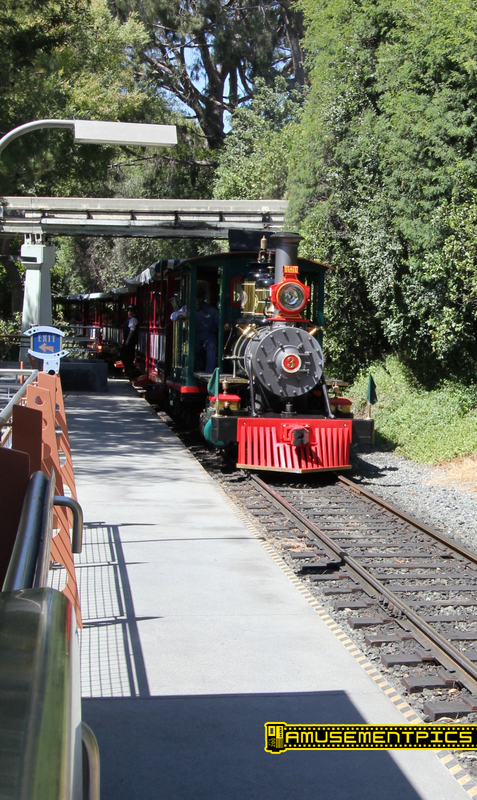 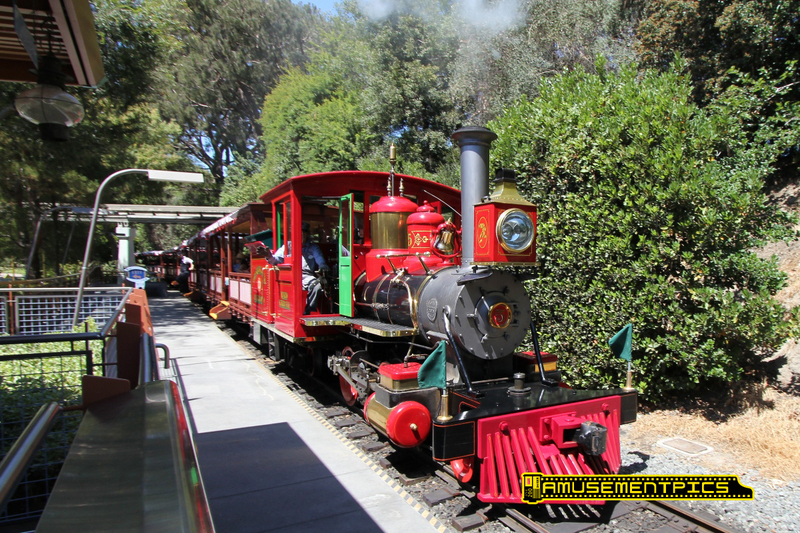 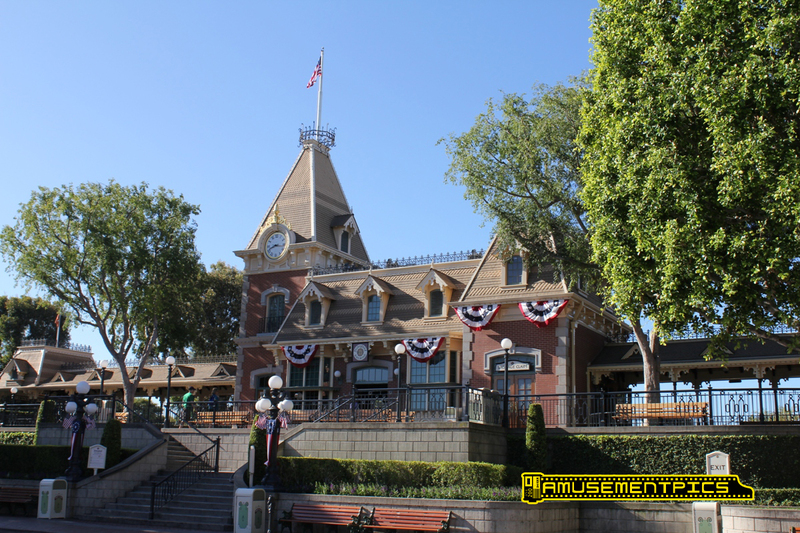 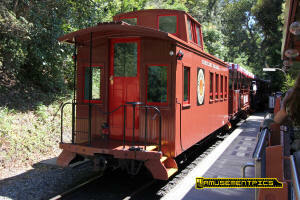 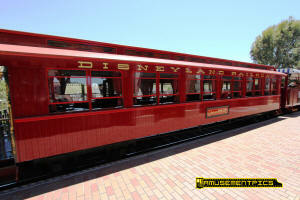 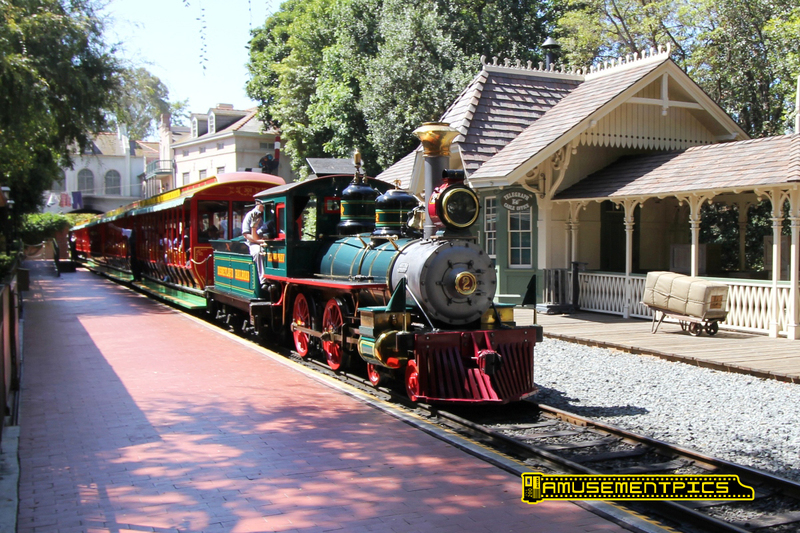 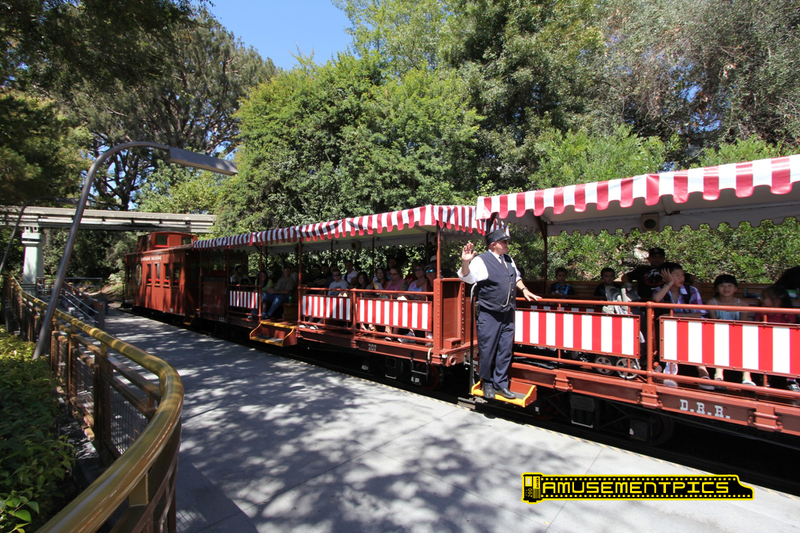 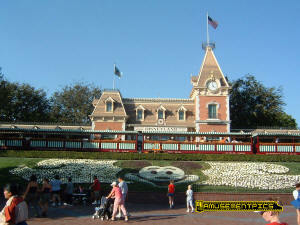 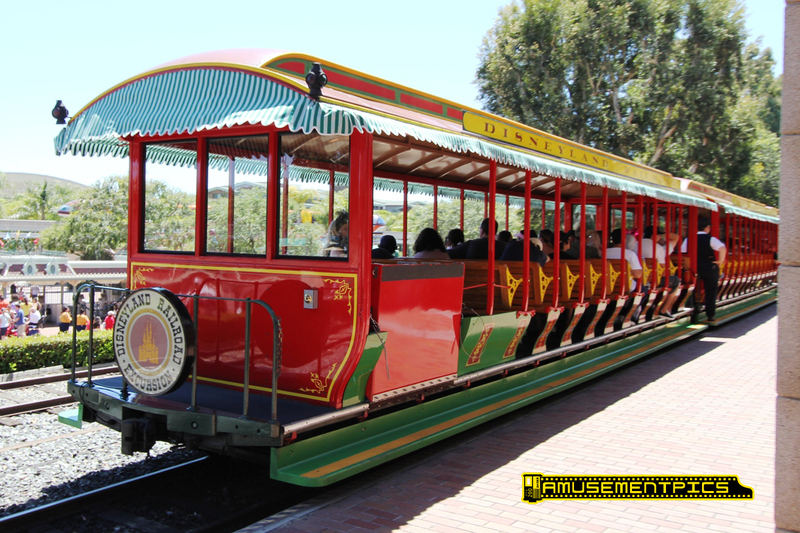 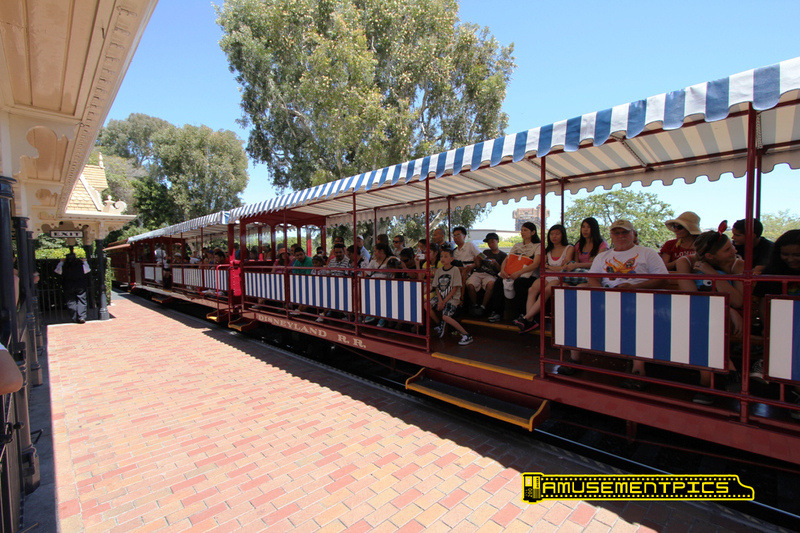 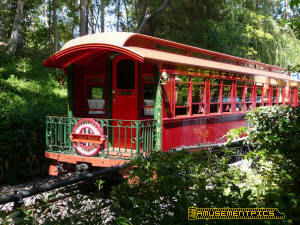 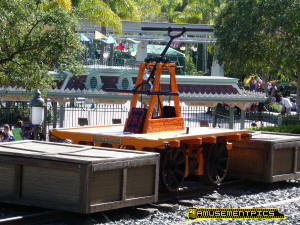 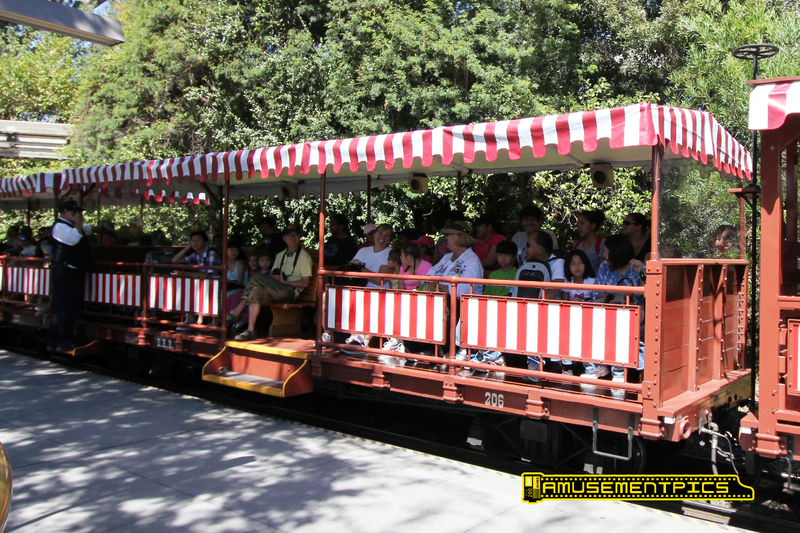 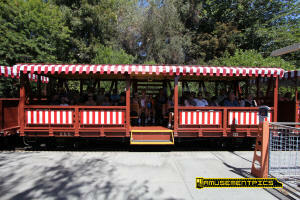 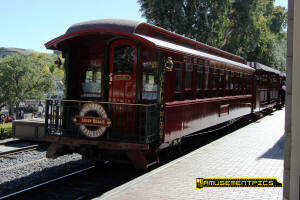 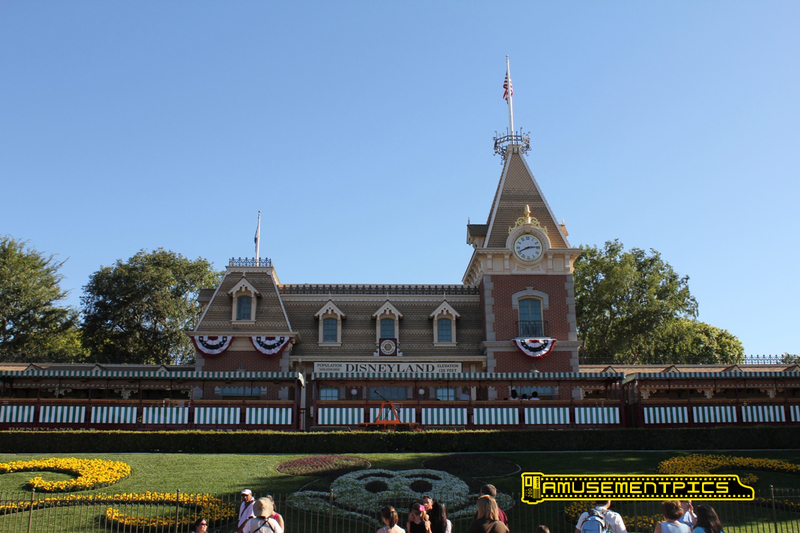 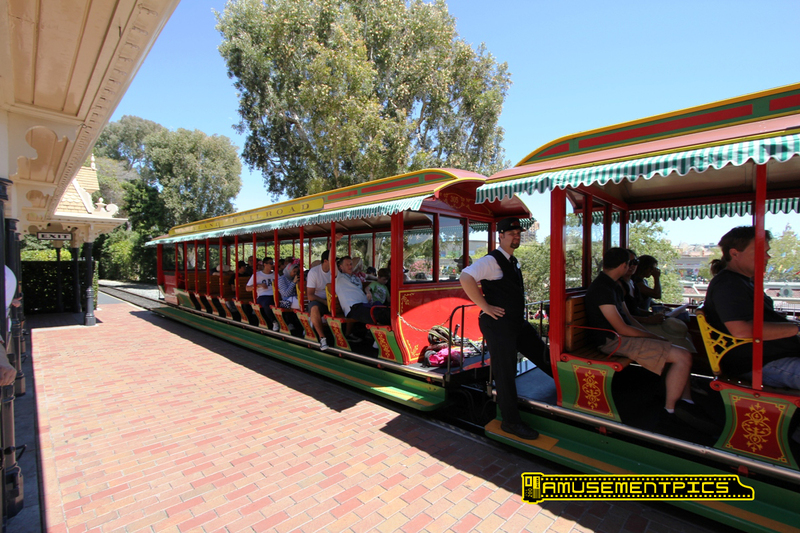 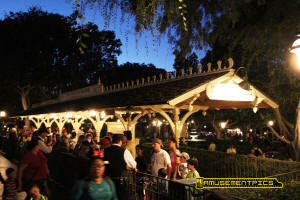 There are four trains currently in operation on the Disneyland Railroad, replacing the original two. 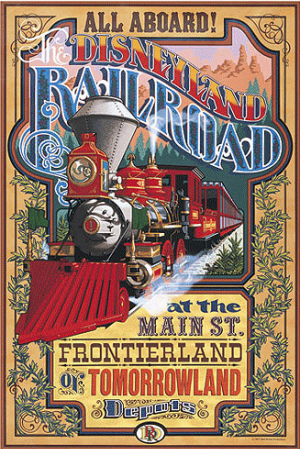 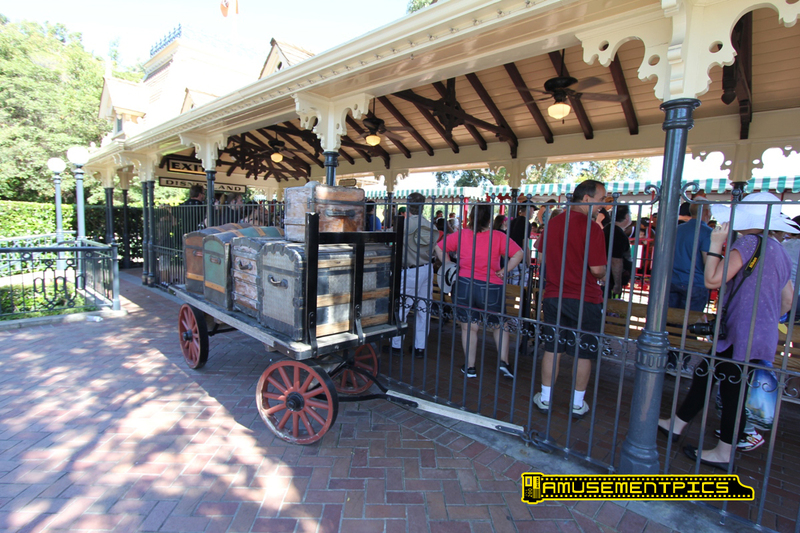 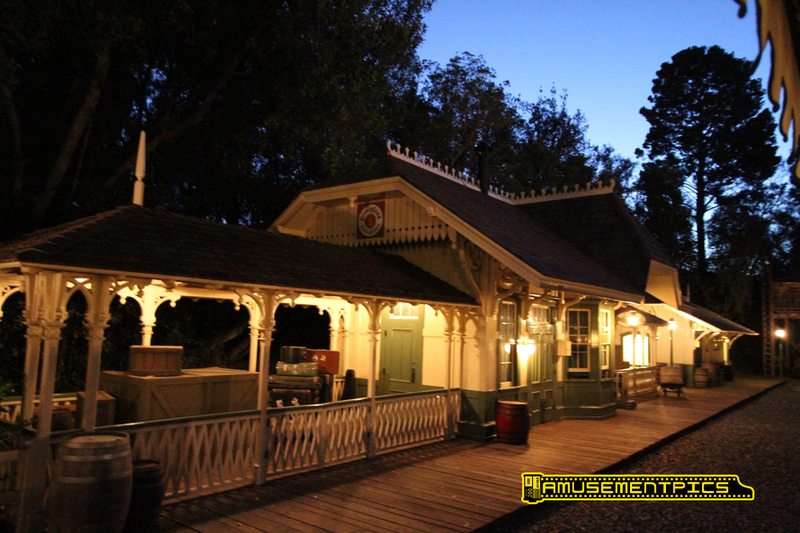 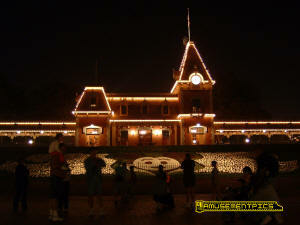 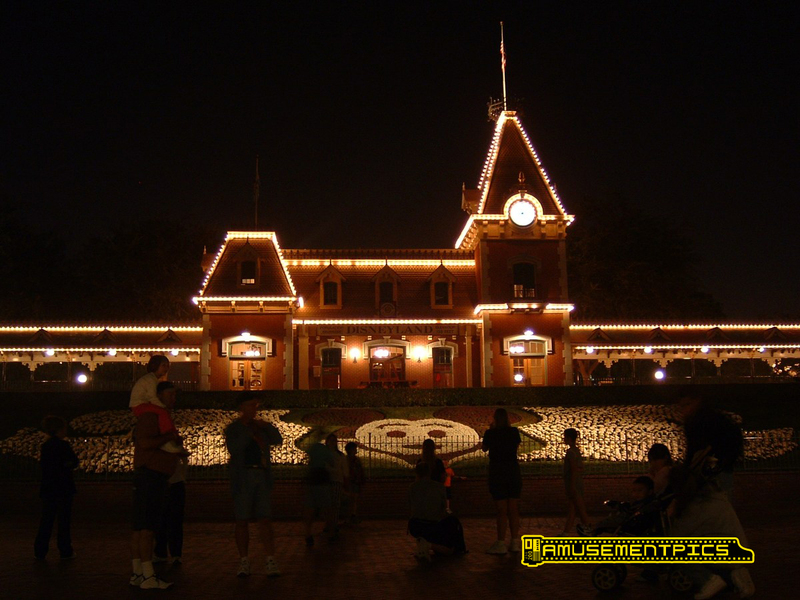 Initially there was a passenger train that only departed from the Main Street Station, and a freight train that only departed from Frontierland. The layout originally featured passing tracks at both of those stations, allowing the other train to pass while one was loading. The remnants of the passing track at Main Street are still visible where the handcar is parked, and the area formerly occupied by the passing track is the gravel in front of the New Orleans Square Station. The 200 series train features cars designed to look like a freight train complete with a caboose. 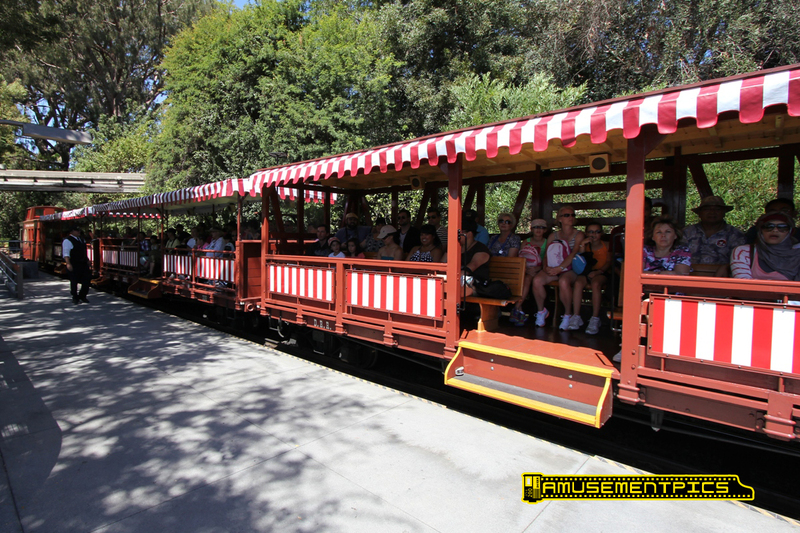 The cars were modified over time with "holiday seating" facing out the right side of the train. 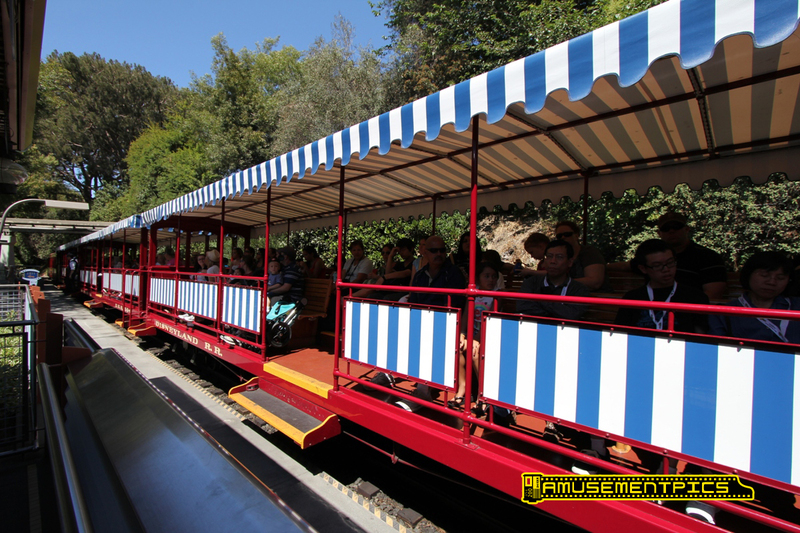 The passenger cars feature red and white striped awnings. 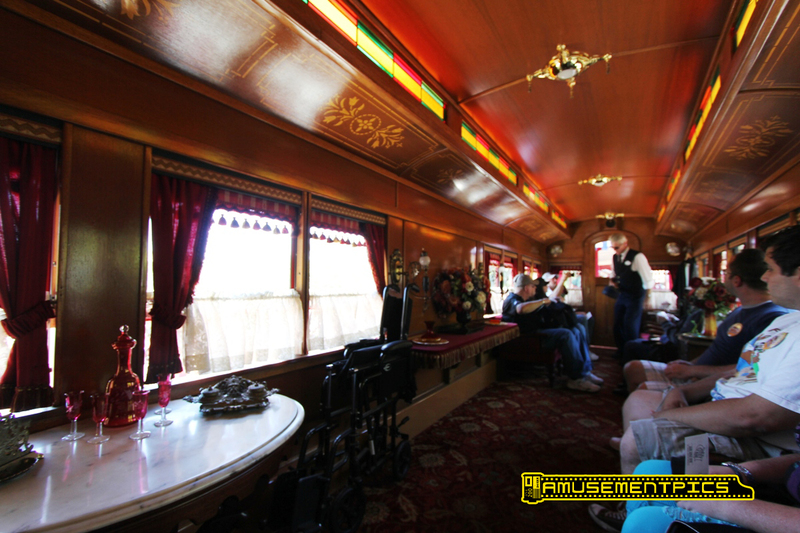 The 300 series cars are the "excursion cars" with forward facing bench seating. 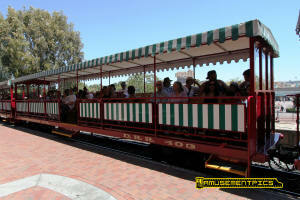 The 400 series feature "holiday seating" the green and white striped awnings. 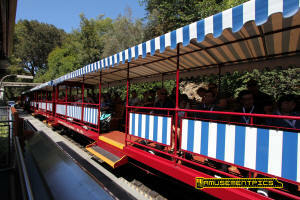 The 500 series feature "holiday seating" the blue and white striped awnings. 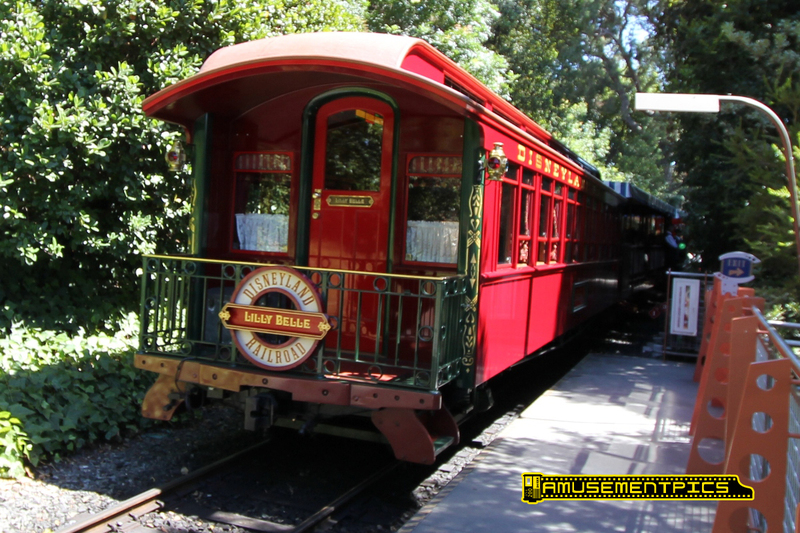 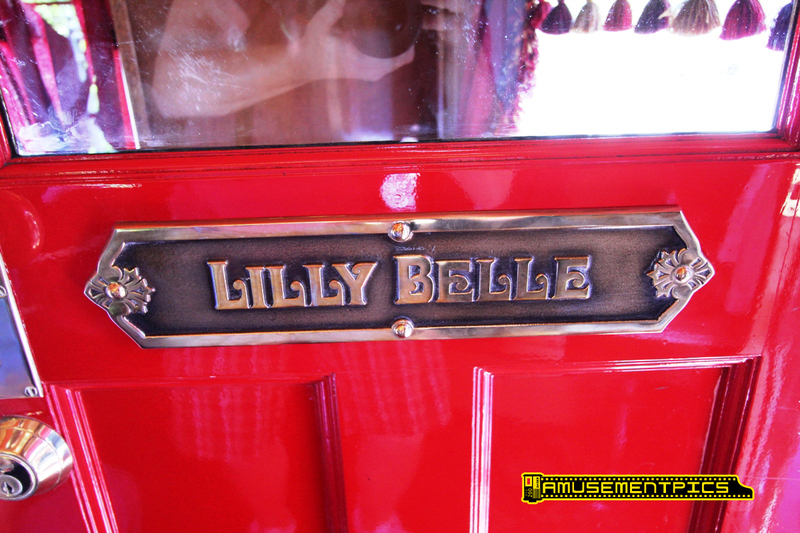 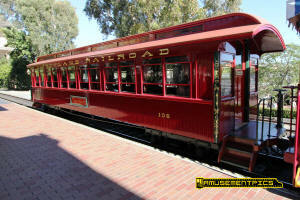 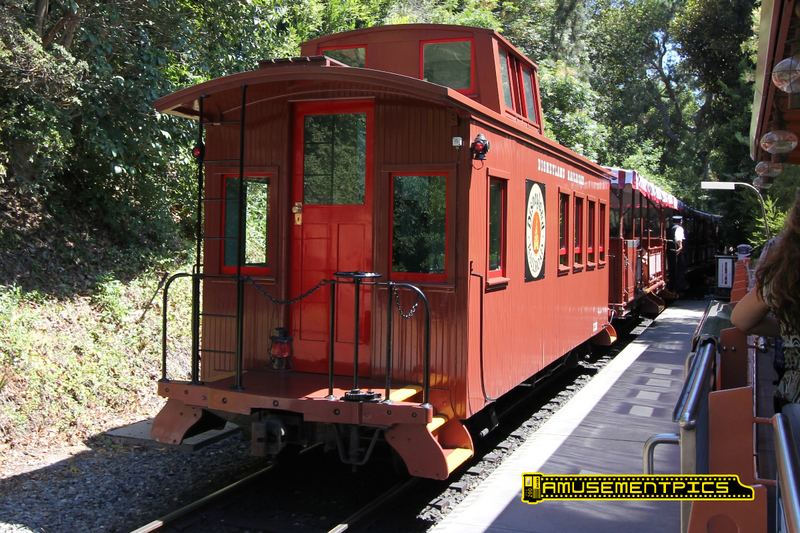 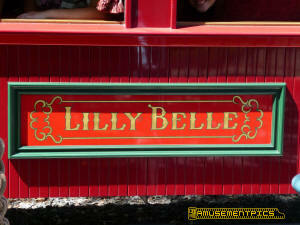 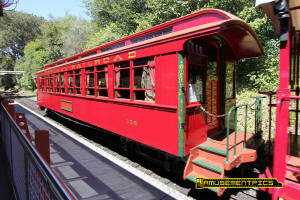 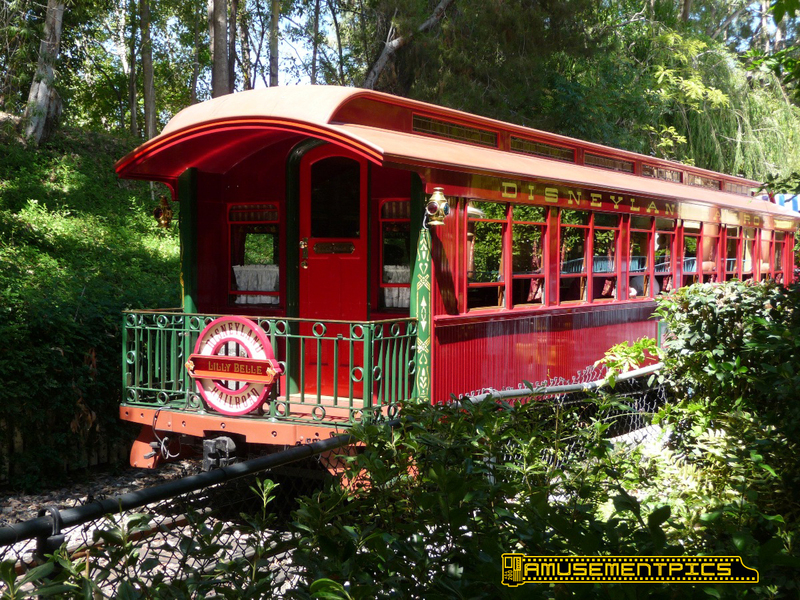 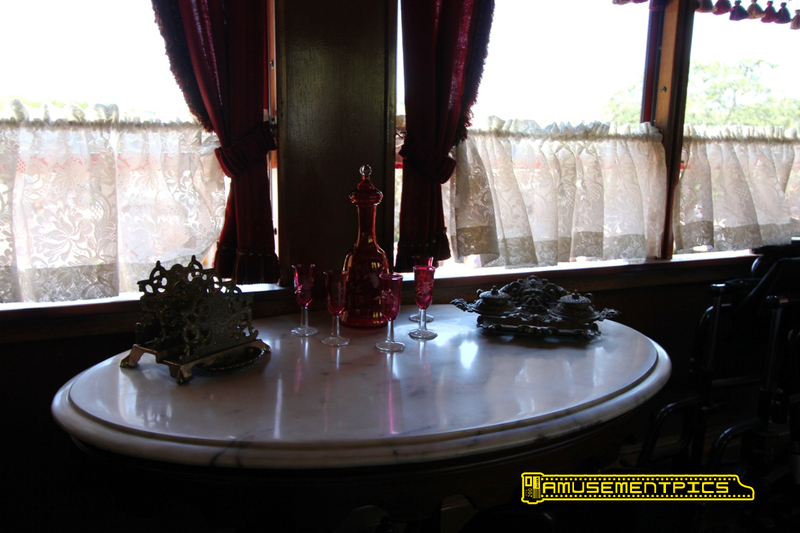 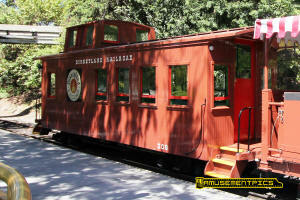 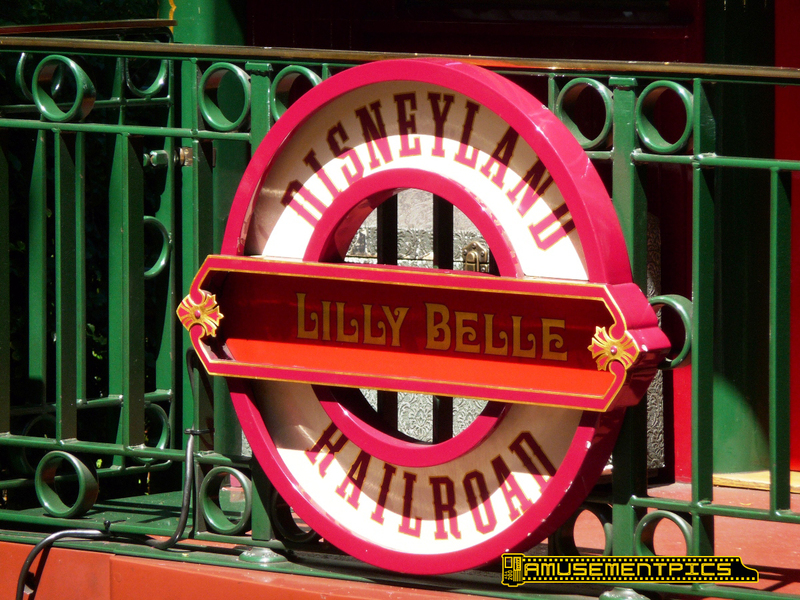 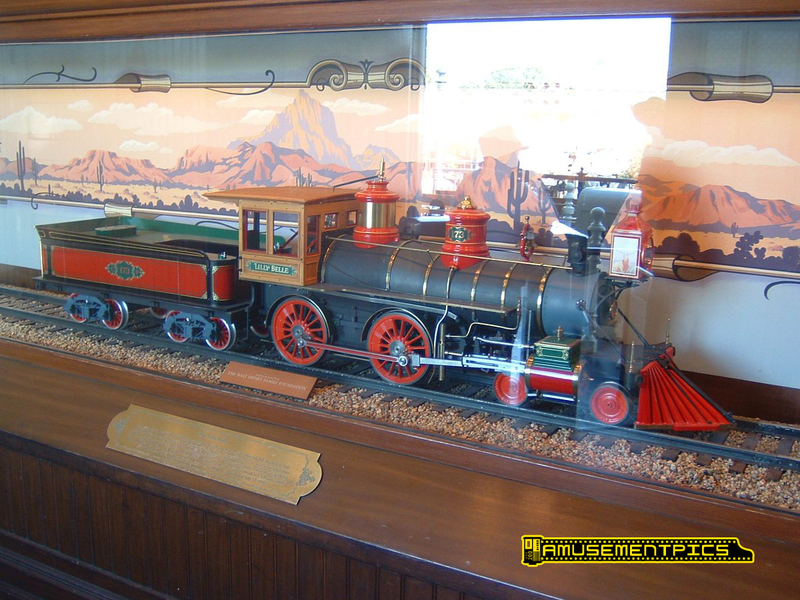 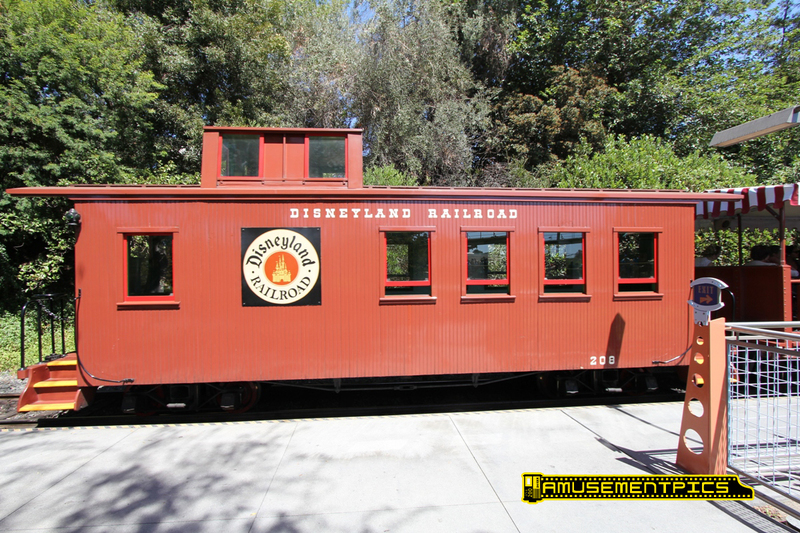 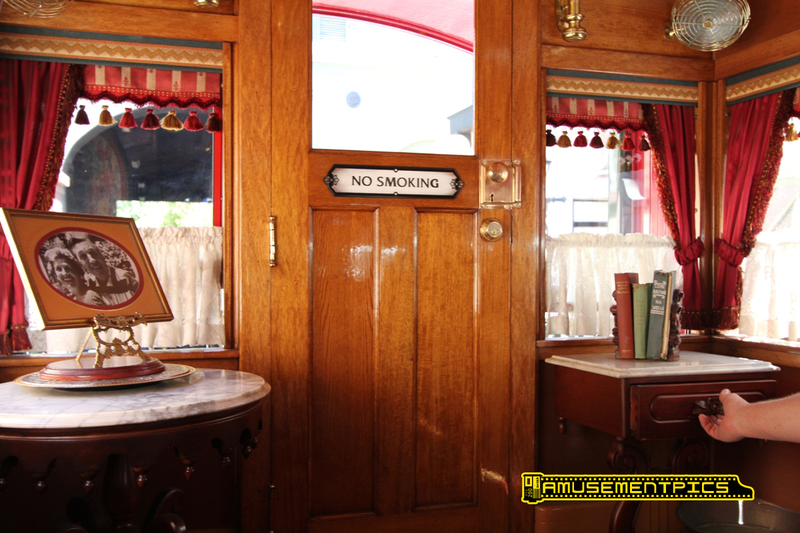 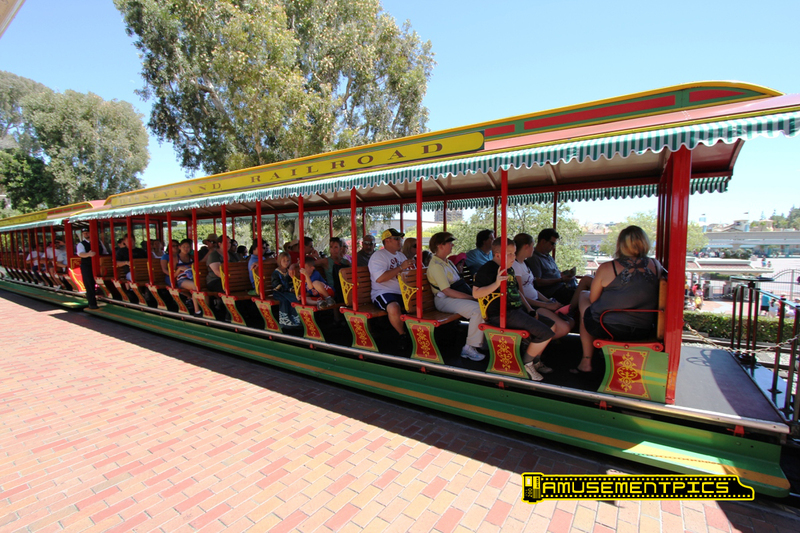 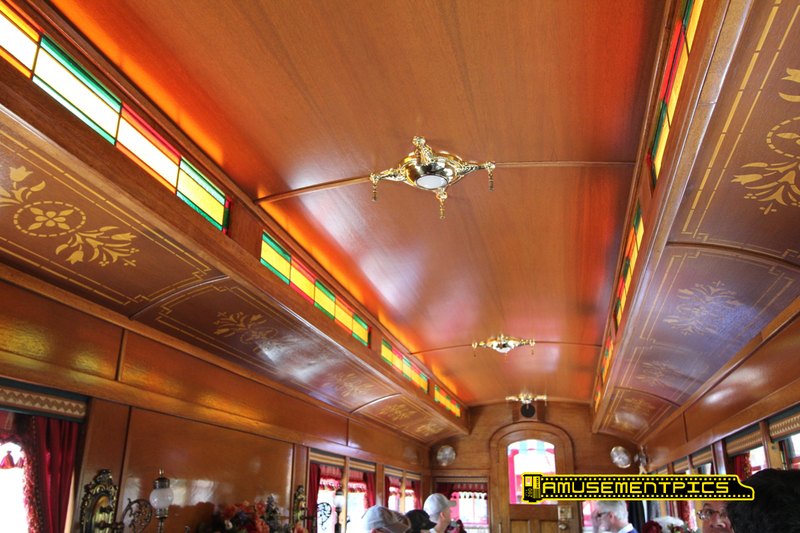 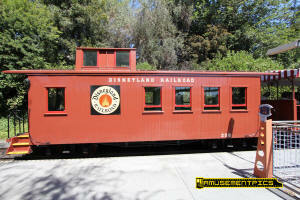 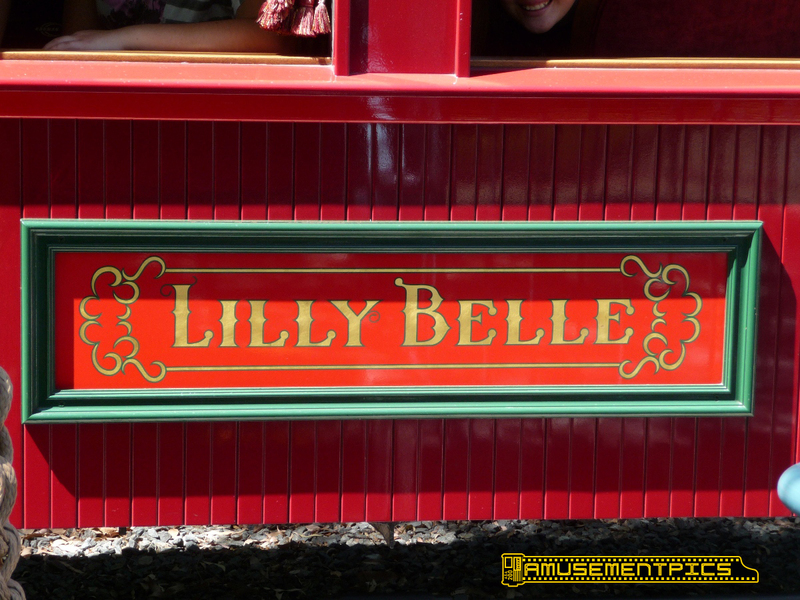 The only one of the original 100 series coaches that served as the passenger train still in operation at Disneyland is #106, now known as the Lilly Belle, named for Walt's wife. 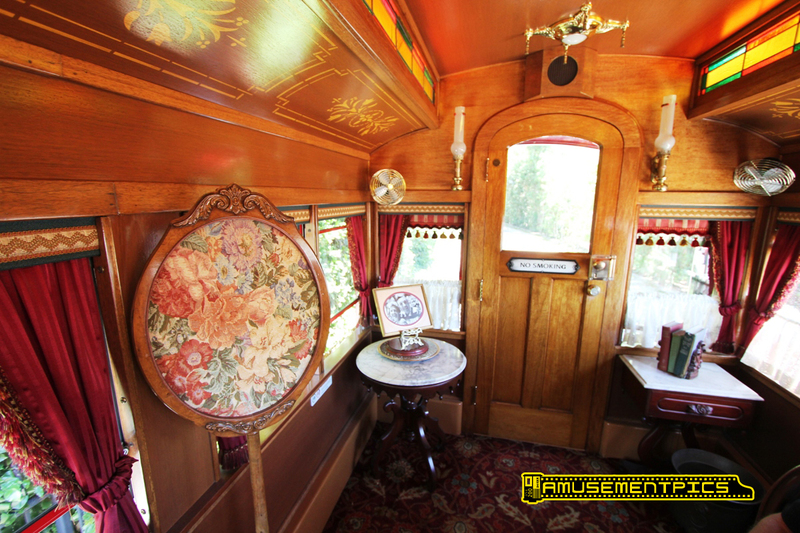 The car was outfitted in the 1970's to be a VIP coach with beautiful finishes and fittings, and serves as a private car available to Club 33 members.